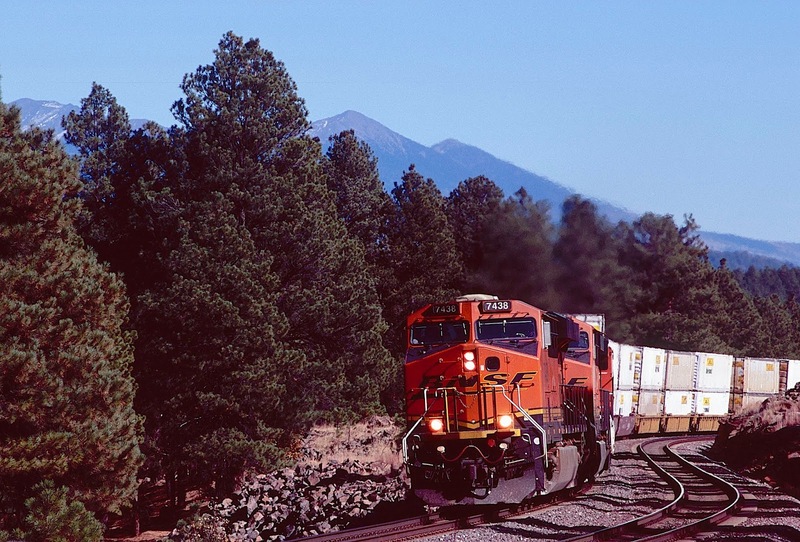 Part Three will look at BNSF from Belen west across the Continental Divide and the Arizona border to Seligman, a former division point reduced to out-of-the-way tourist attraction on old US Highway 66. Because we are surveying vast spaces in a relatively few images, coverage is not as detailed as many of my other posts. However, we will see all the best locations, plus some much more obscure. 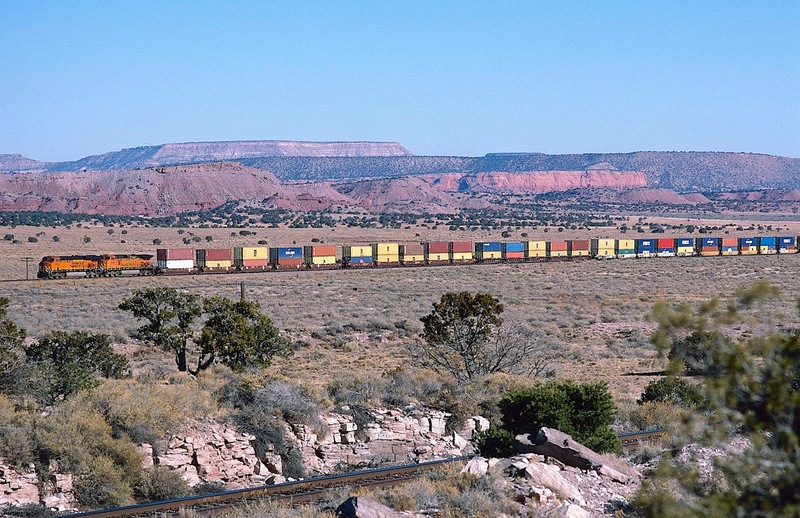 The railroad here crosses both dormant and active volcano fields, multiple lava flows, high desert, sandstone cliffs, Native American pueblo culture, the Petrified Forest National Park, Meteor Crater and the Little Colorado River (which almost never has any water in it). Because of the lack of rainfall (11.5 inches annually in Gallup; 7 inches in Winslow), settlements are few and far between, and those living in them are a mixture of Native Americans, hermits, outlaws, railroad workers, missionaries and almost any other group you can think of. And, I would point out, these groups are not necessarily mutually exclusive. The Transcon dominates this country. Even in the 21st century, in the age of interstate highway and instant communication, life here still in large measure revolves around the rhythm of steel wheels on steel rails. As in Parts 1 and 2, each photograph is numbered to correspond to its location on the maps following each section. 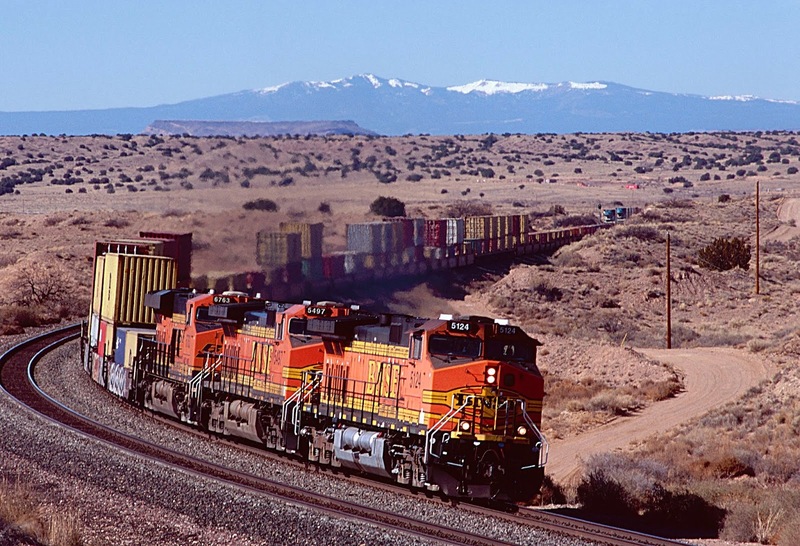 If you don't know much about railroads and you look at a map, you will wonder why the Transcon did not go west out of Amarillo to Albuquerque, and then continue straight west into Arizona, following what later became the route of Interstate 40. 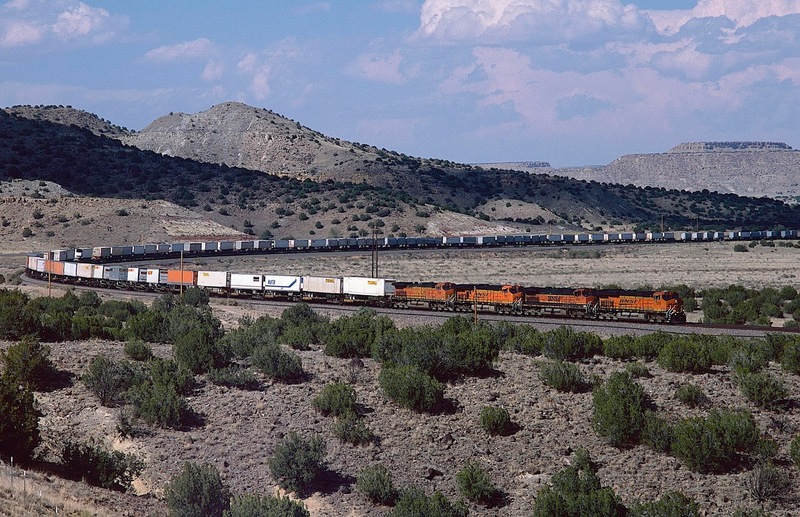 Well, for one thing, the terrain west of Santa Rosa, New Mexico, though not mountainous, is most inhospitable for railroads -- one long sustained grade after another, mile upon mile. 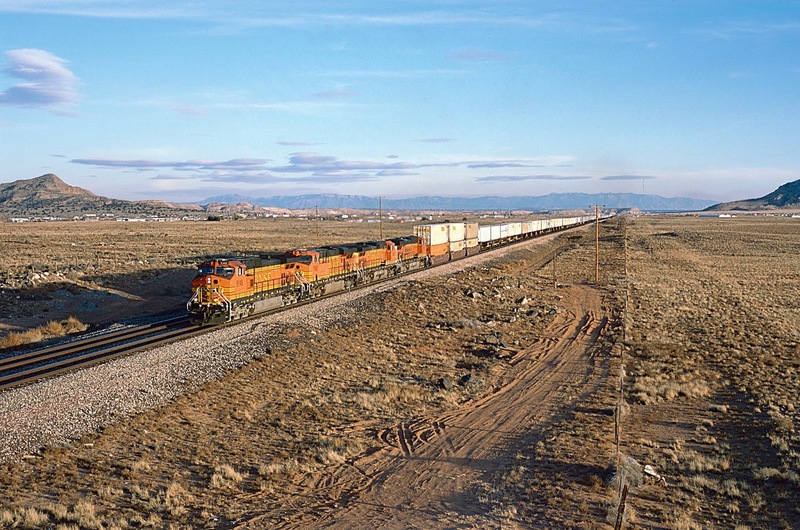 And if that were not obstacle enough, any railroad through that country would have been forced to enter Albuquerque from the east through Tijeras Pass, a narrow slice through the Sandia Mountains in which eastbound trains would have encountered over twenty-plus miles of three percent grades. Also, west of Albuquerque, the land above the Rio Grande Valley rises abruptly, almost like the wall of a fort. A railroad climbing that impediment would have required multiple switch-backs and steep grades. 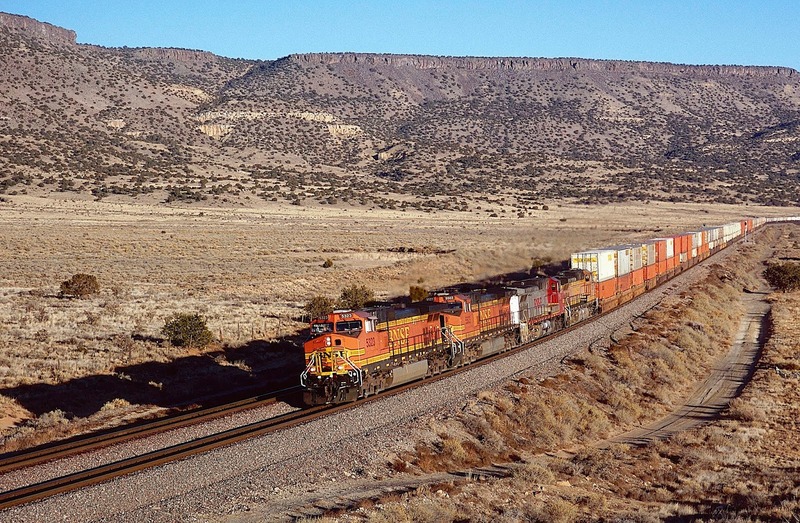 Driving east on Interstate 40 today, you will see the steep grade as you crest the hill and peer into Albuquerque and the river valley below, one of the grandest urban images in North America -- but no place for a railroad. 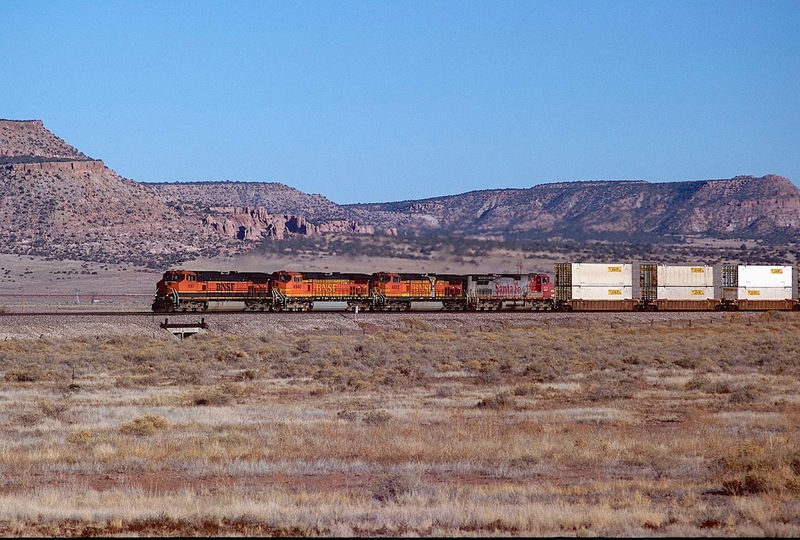 So the original Santa Fe Transcon entered Albuquerque from the north through Apache Canyon, after having crossed the three percent grades of both Raton and Glorieta Passes, and did not attempt to leave the Rio Grande Valley by crossing the high ridge west of town. Instead, the line followed the river south, eventually climbing a much shallower grade at Isleta Pueblo. And when the Belen Cut-off was constructed, it ran far to the south of Albuquerque, crossing the river at Belen, then climbed out of the valley, joining the original mainline at Dalies. 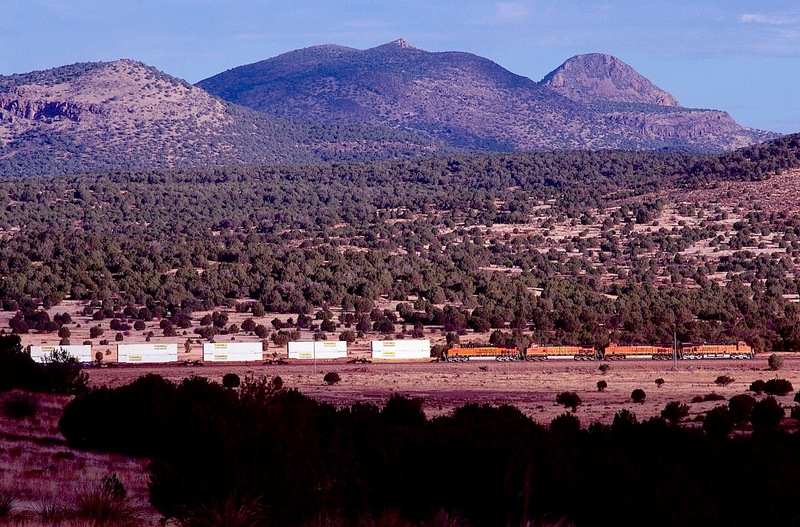 The following images show the modern Transcon as it climbs out of the Rio Grande Valley, then almost immediately heads downgrade toward the Rio Grande Rift and the Rio Puerco Valley. 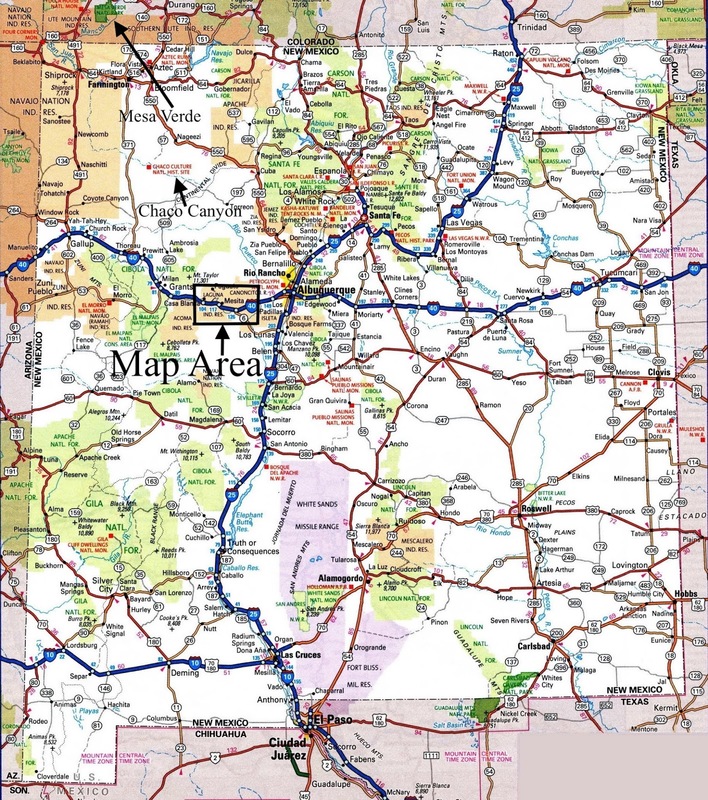 The country here is dry and isolated, even though only a stone's throw from Interstate 25 and civilization. 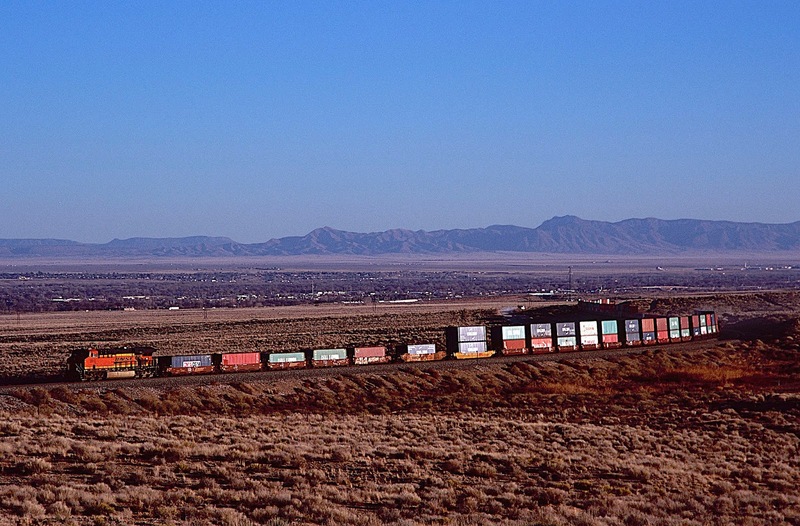 Photograph #1: Late in the afternoon of a pleasant January day, an eastbound intermodal train is coasting downgrade toward Belen, New Mexico, with the valley of the Rio Grande and the Los Pinos Mountains in the background. Photograph #2: An eastbound empty coal train is passing the extinct Los Lunas Volcano, part of the Cat Hills Volcanic Field. 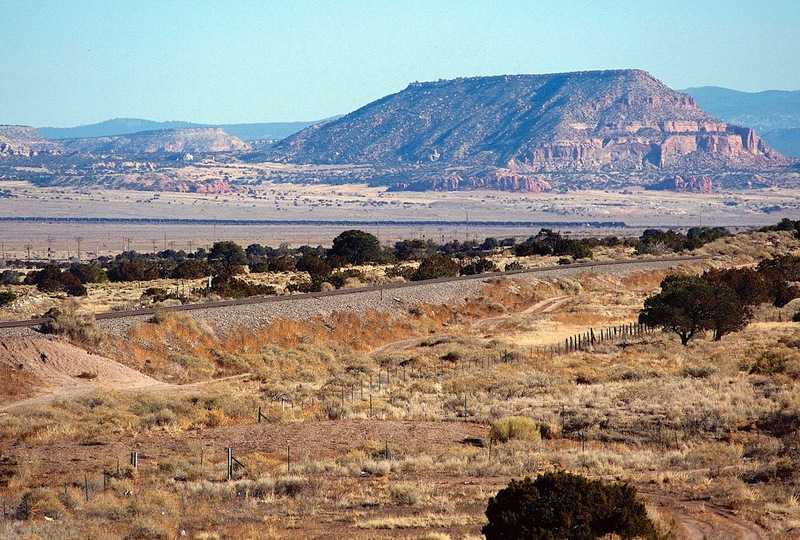 Los Lunas today is actually composed of two different volcanoes that erupted millions of years apart. Photograph #3: Eastbound autos are climbing out of the valley of Rio Puerco toward the hills that overlook the valley of the Rio Grande. In the background towers Mesa Lucero, part of the Lucero Volcanic Field. An ancient lava flow caps Mesa Lucero at the very edge of the Rio Grande Rift, a stunning fault line in which the earth has, over millions of years, deformed itself into a series of trenches running approximately from central Colorado to Chihuahua, Mexico. Photograph #4: Eastbound stacks beneath Mount Taylor, a currently inactive stratovolcano straddling the transition zone between the Colorado Plateau and the Rio Grande Rift, named in 1849 for president Zachary Taylor. Photograph #5: Amtrak No. 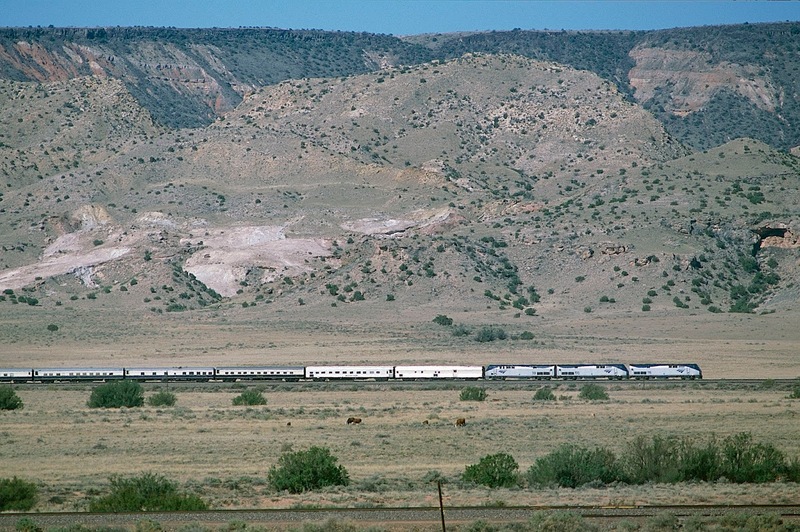 3, the westbound Southwest Chief, has climbed out of the valley of the Rio Grande and is headed downgrade toward Rio Puerco. The Monzano Mountains tower in the background. 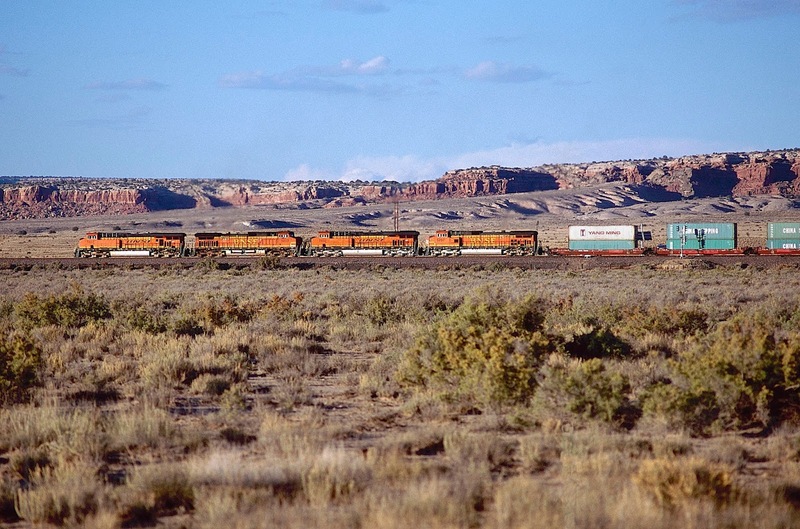 Photograph #6: An eastbound Z-train is climbing out of the Rio Puerco Valley and the Rio Grande Rift. Mesa Lucero watches silently in the background. Photograph 7: Westbound autos are preparing to turn north toward Rio Puerco. 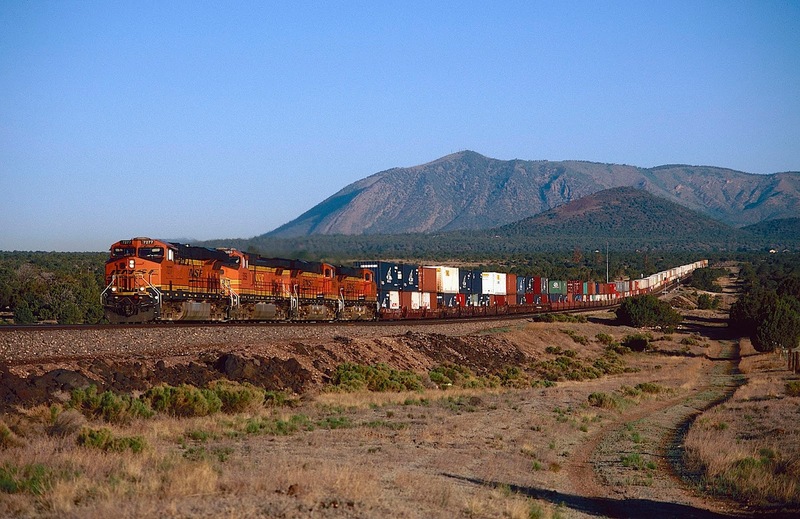 Photograph 8: BNSF 7862 East accelerates upgrade beneath Hidden Mountain, an extinct volcano along the Rio Grande Rift. Above the volcano is an edge of Mesa Lucero. 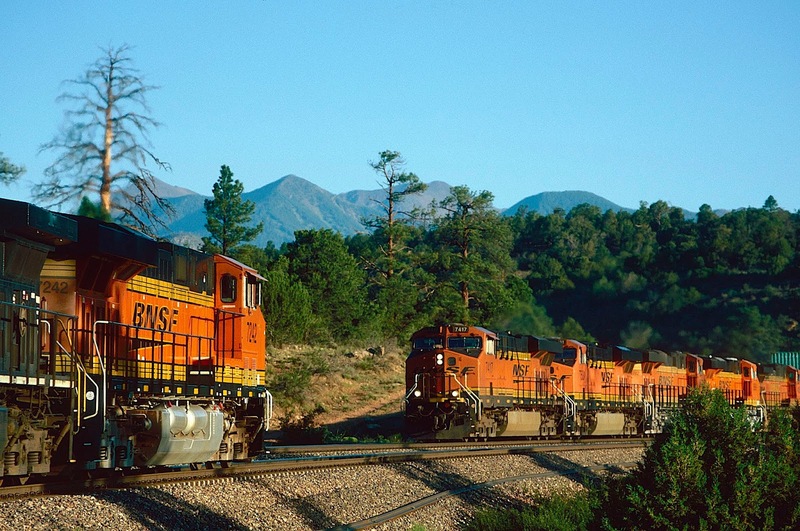 In this and the immediately preceding image, as well as every other photograph in this section, you will note that all trains are "reverse running" on the left-hand main. 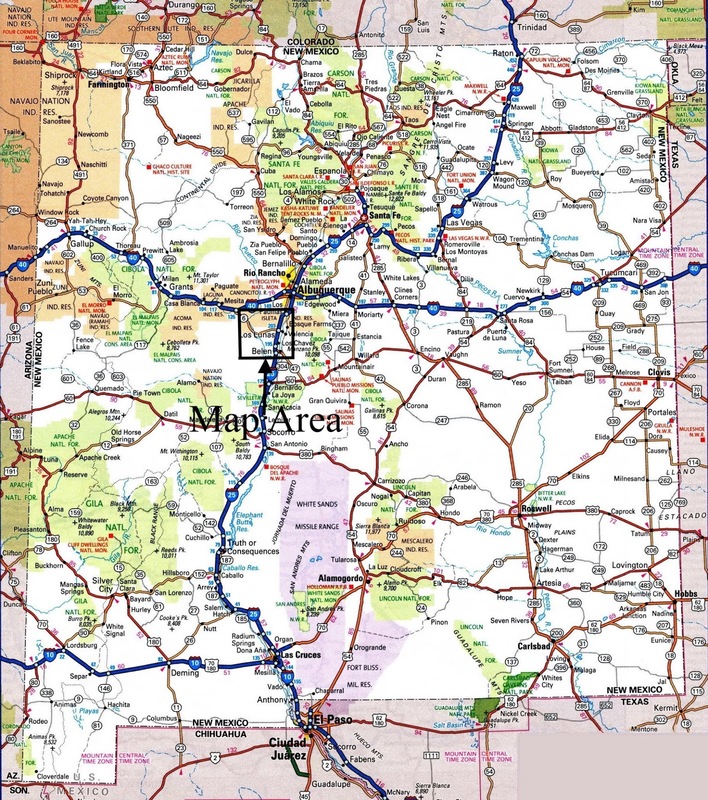 This is standard practice through this area, because the left-hand track for westbounds follows a shallower grade to leave Rio Puerco Valley and climb to Laguna Pueblo. 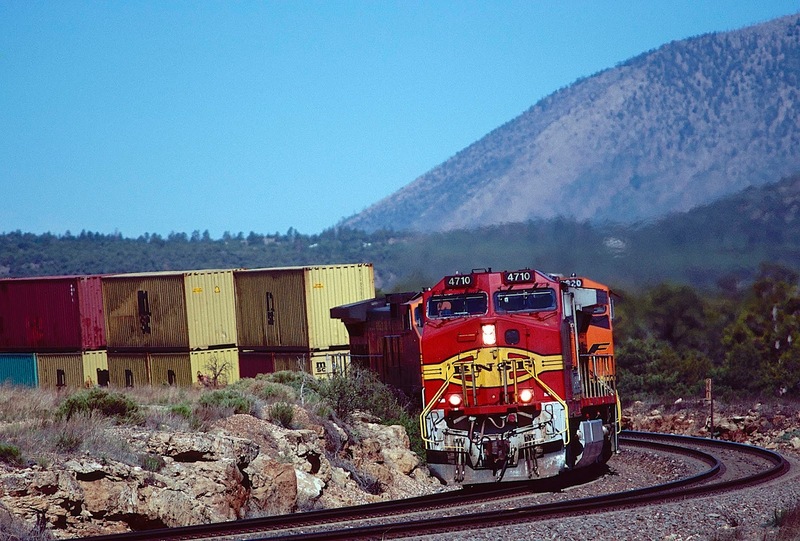 Photograph 9: A westbound Office Car Special runs beside Hidden Mountain. In less than a mile, the tracks will cross Rio Puerco on their trek to Laguna Pueblo. 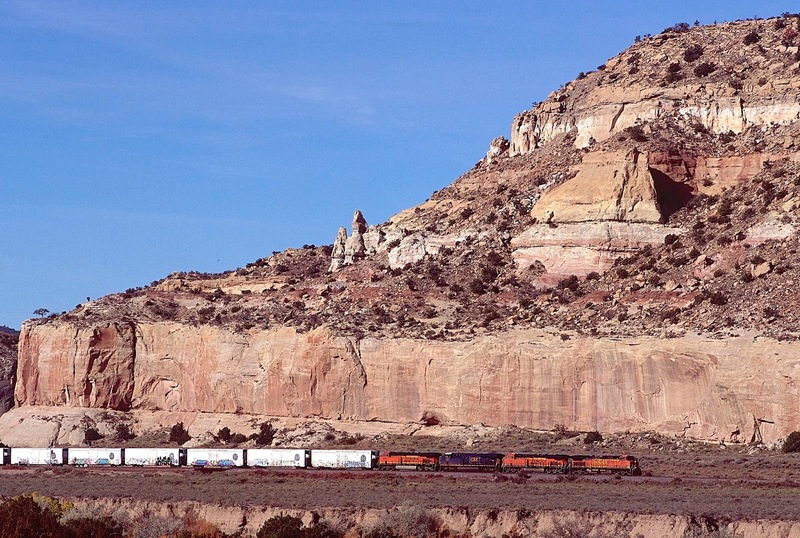 The valley of the Rio Puerco, at least where the Transcon crosses, contains some of the most spectacular scenery in the western United States. "Piffle!" I can already hear you shout, or perhaps something stronger. 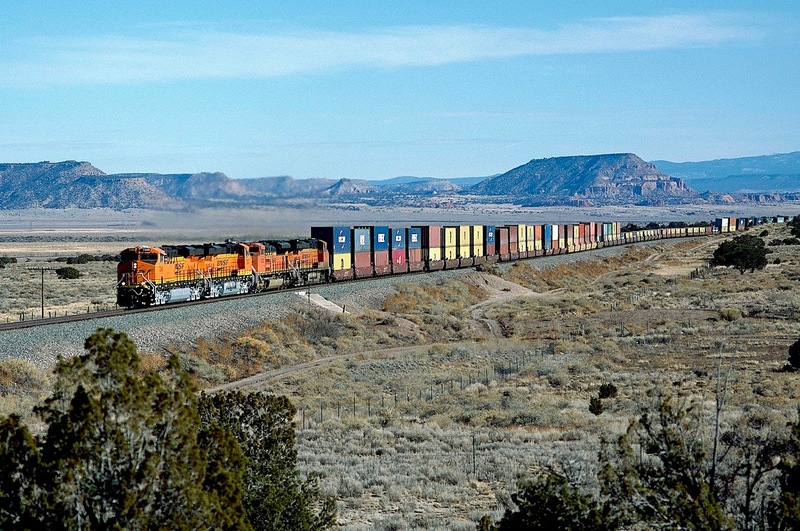 "The Transcon's bridge across the Rio Puerco is next to a landfill!" Well, that is true, but it does not detract from the beauty of the location, at least in my book. To the west is Mesa Lucero, towering above the valley like a spring thunderstorm. Traces of lava flows from long extinct volcanoes sliver across the dry terrain like paint running off the edge of a wall. The two tracks of the Transcon separate in this valley, with the shallower grade running along the base of the mesa, while the stiffer grade runs more or less beside the river, which is several hundred feet below in a canyon that the railroad approaches but does not cross again. 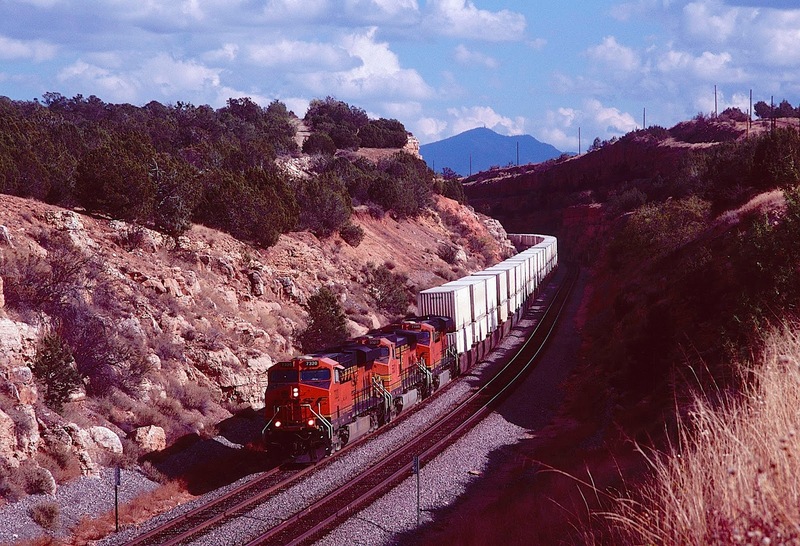 New Mexico State Highway 6, once the Old Trails National Highway, follows the tracks closely, presenting any number of wonderful railfan locations. The best time of year for photography here is in high summer when the sun rises about 30 degrees north of due east. 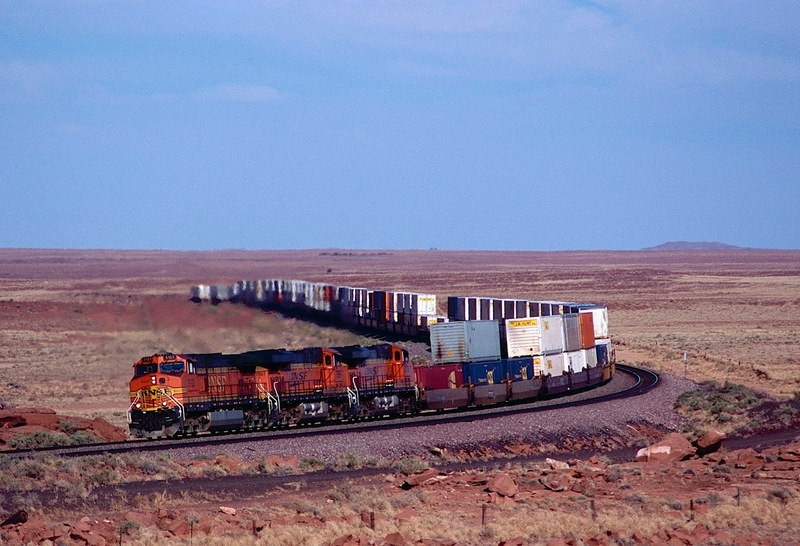 Then it is possible to photograph trains in both directions. A word of warning: Eastbound trains often back up in this valley, waiting for a green board as trains ahead slowly, one-by-one, work their way into the yard at Belen. Congestion can be quite severe when many eastbound are fleeted and arrive one after another in the early morning. "There are 19 Pueblo tribes in New Mexico, and each Pueblo is a sovereign nation. 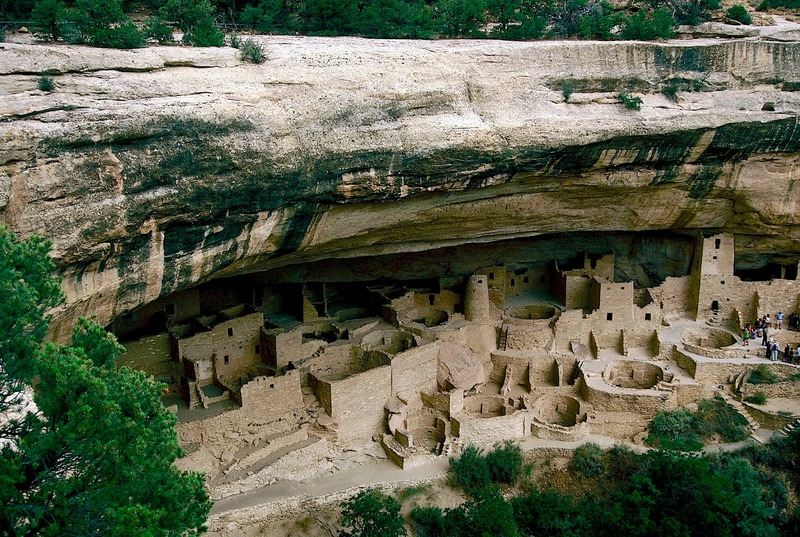 Today Pueblo people are located primarily in New Mexico; however, at one time our home land reached into what is now Colorado and Arizona, where we established incredible dwellings and trading centers like those located at Chaco Canyon in northwestern New Mexico and Mesa Verde in southwestern Colorado. Pueblo people have preserved our identity in the face of multiple colonizing nations, and today, as always, we value our identity and traditional ways of life. At the same time we live in modern houses, working and living both on and off our reservations. Our beliefs and actions are still guided by Pueblo Core Values, which include Love, Respect, Compassion, Faith, Understanding, Spirituality, Balance, Peace and Empathy. We continue to participate in our traditional celebrations and ceremonies throughout the year, maintaining our connection to our communities, to our ancestors and to the earth." These lines resonate with me, because I have visited both Chaco Canyon and Mesa Verde. You cannot see these two places without being overcome by their grandeur and spirituality. Both are beyond words. They are the best examples I have ever seen of living within the confines of one's existence. Of course, the great question is why did the people abandon those two settlements? I do not claim to know. But if you have not visited either, then I urge you to see both. Your life will be changed for the better. Photograph #10: Eastbound trailers are rolling downgrade at the location where the two tracks separate. The line in the foreground takes a more circuitous route up the westbound grade. Mesa Lucero looms in the distance. Photograph #11: Here is the westbound American Orient Express on the shallower gradient. The steeper track is in the foreground. The American Orient Express ran luxury trains across the United States from 1989 to 2008, using Amtrak power and crews. Baggage and passenger cars were owned by the company. Fares ranged as high as $10,000 for a one-way trip across the continent, including meals, hotels and frequent stops at scenic locations -- much like a cruise ship. 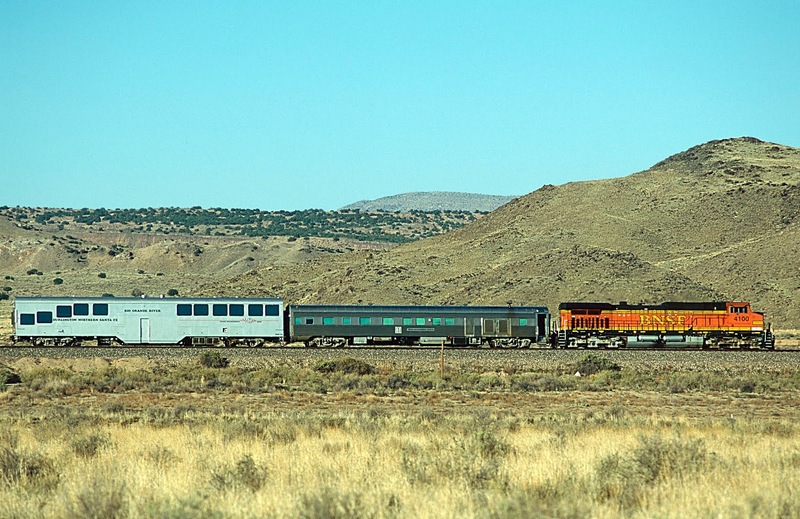 The Great Recession of 2008 killed the market for luxury passenger trains. 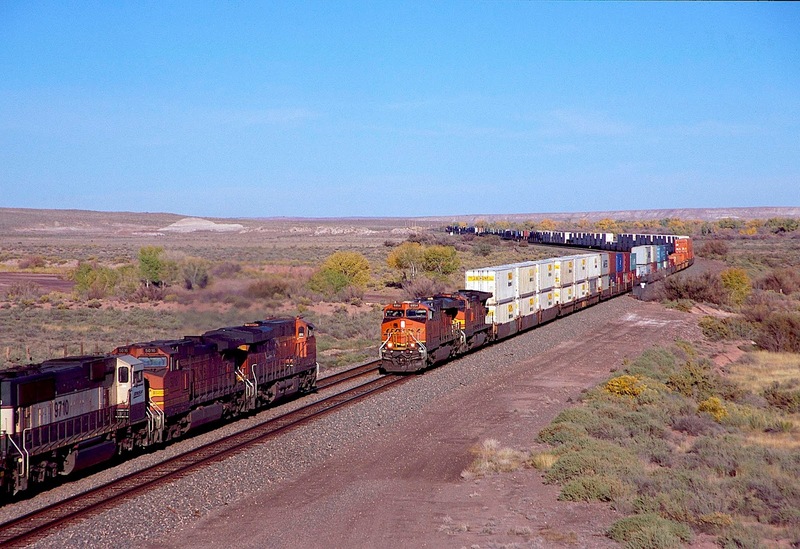 Photograph 12: In the valley of Rio Puerco, on the edge of the Rio Grande Rift with Mesa Lucero watching in the background, eastbound stacks are rolling downhill while a westbound Z-train is taking the shallower grade toward Laguna Pueblo. Photograph 13: This image was taken from the overpass of the Old Trails National Highway, the first transcontinental route across the United States. Large portions of that road were later supplanted by U.S. Highway 66 in the western United States, and old 66 was itself obsoleted from Oklahoma City westward by Interstate 40. 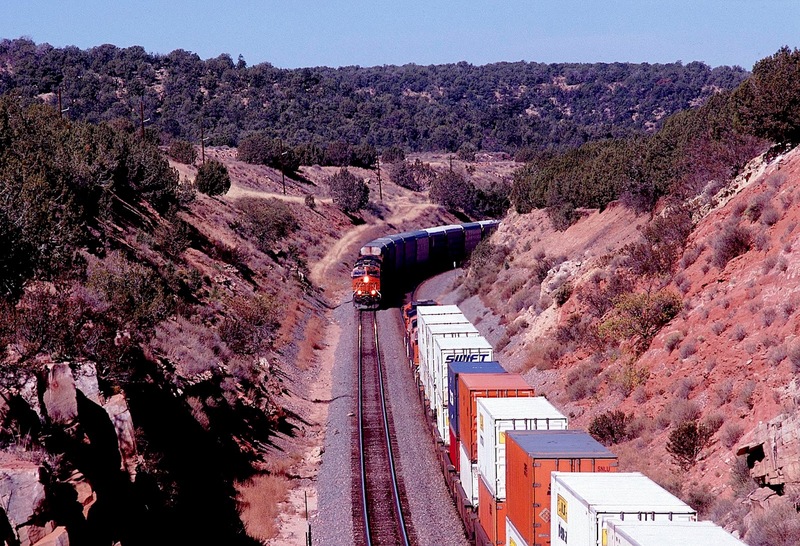 Photograph 14: These eastbound stacks have just left Laguna Pueblo and are headed toward Rio Puerco. In the background is part of the huge lava flow from Mount Taylor. The surrounding soft desert soil has eroded away over the eons, but the lava cap remains at its original elevation. 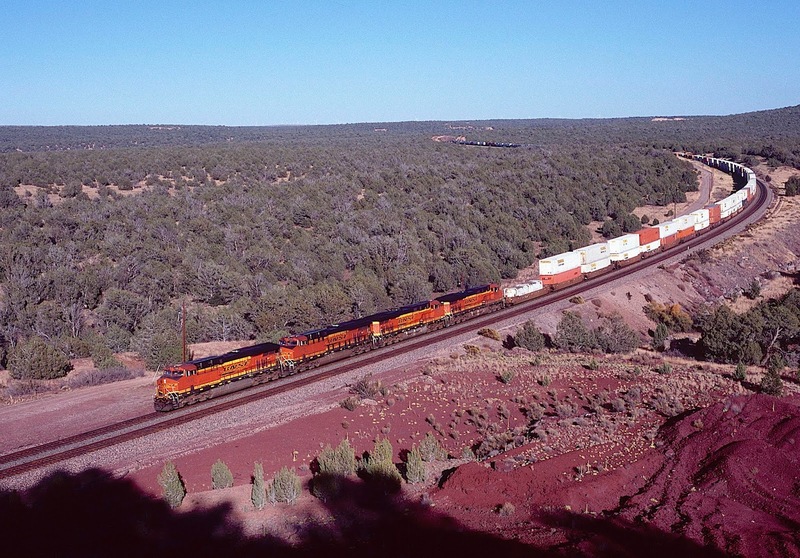 Photograph 15: Westbound stacks have just crossed under Interstate 40 and are about to enter Laguna Pueblo. 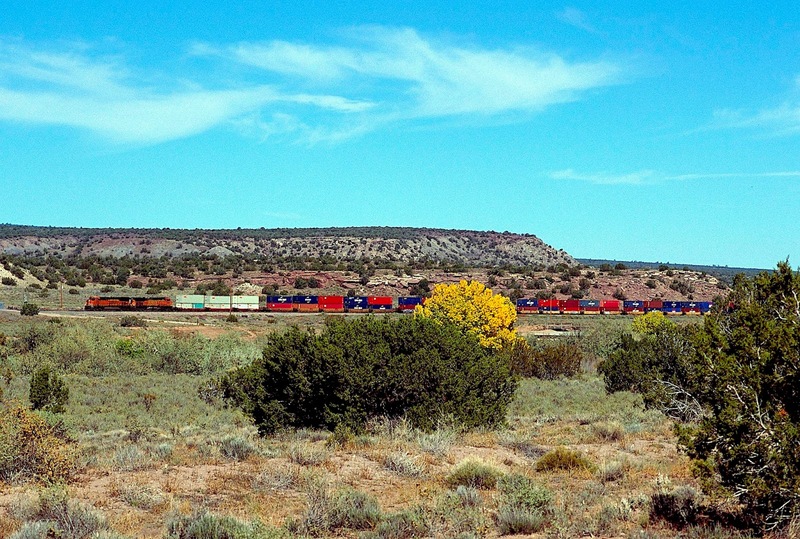 Photograph 16: This westbound intermodal is running beside one of the beautiful mesas in Laguna Pueblo. Photography is forbidden here unless one obtains permission -- which has been freely granted to me the two times I have taken photographs on the reservation. The cliffs provide a most striking example of the geology in this part of the world. The lower, lighter portion is Jurassic sediment deposited 150-200 million years ago by ancient waters. Above that is volcanic deposition from Mount Taylor, left behind by eruptions in the past few millions years, including the deep lava cap at the top. This is the clearest example I have ever seen of stata from two entirely separate geologic ages forming such a clean boundary. Rio San Jose is in the foreground, responsible for eroding the soft soil at the bottom of the cliff. Rainfall here averages about seven inches per year, so water is precious. 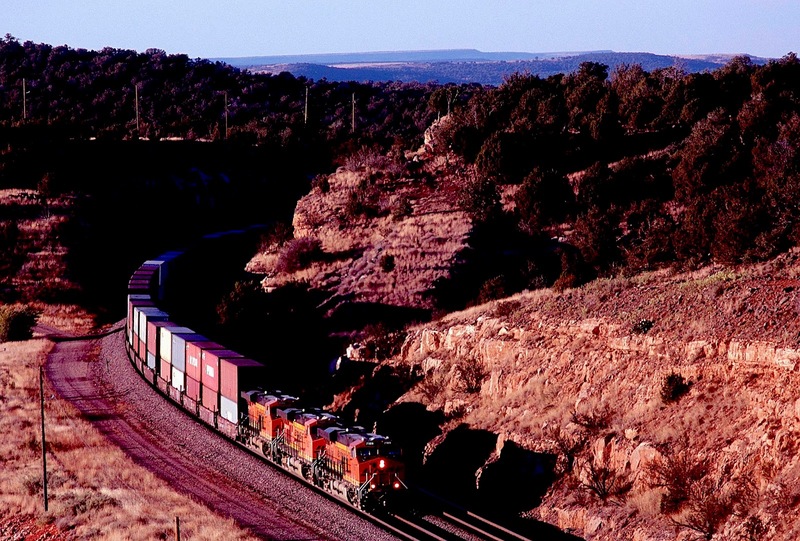 Photograph 17: More westbound stacks in the canyon of Rio San Jose -- Laguna Pueblo. Photograph 18: The big curve at Laguna Pueblo, still in the valley of Rio San Jose. Okay. First things first. 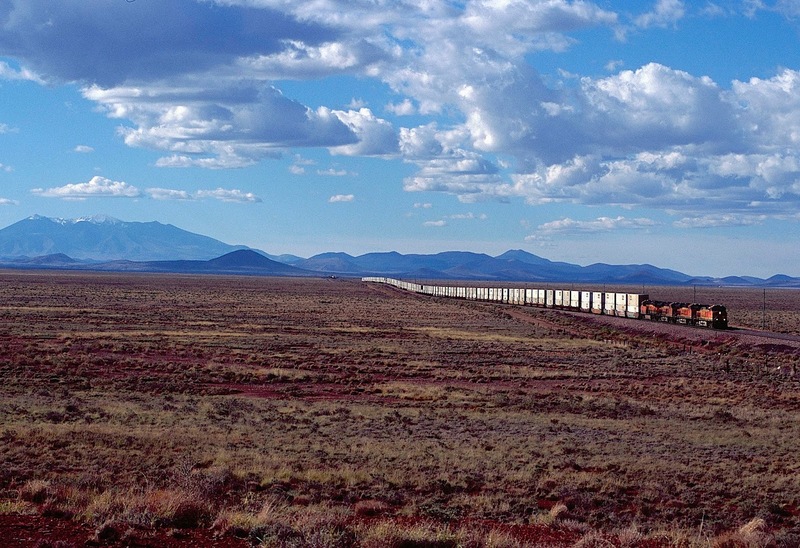 The Transcon does not run through Meteor Crater. It does not even run close enough to see the big hole in the ground. At its nearest, the Transcon runs about four miles north of this national landmark. 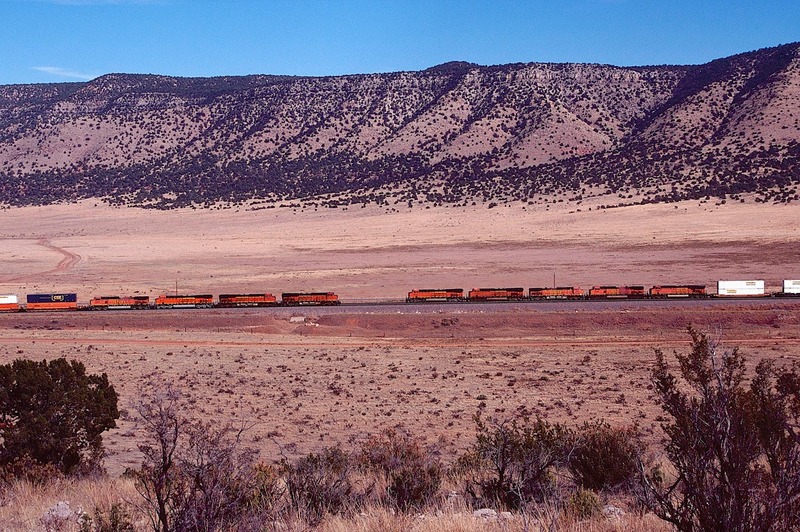 But I wanted to get your attention; also, the Meteor Crater Exit on Interstate 40 (Exit 233) leads to some wonderful locations for photographing the BNSF in the Arizona high desert. 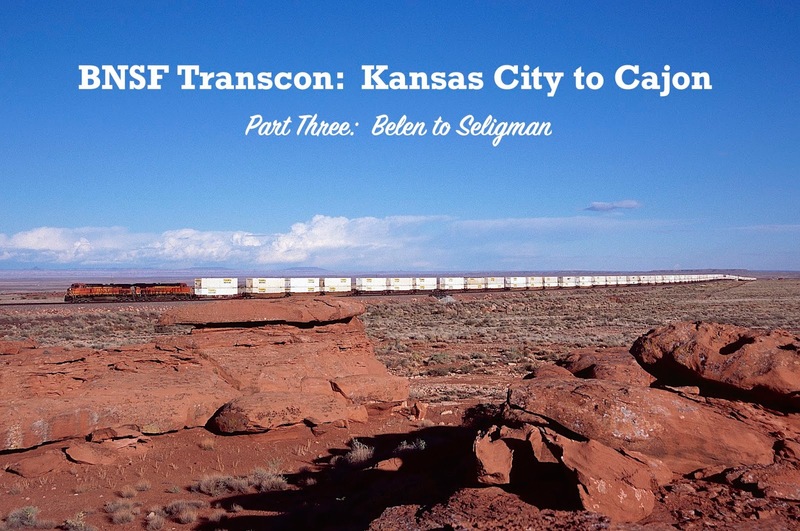 This section of the Transcon survey covers about 500 miles, making it by far the largest single segment in the review of the BNSF from Kansas City to Cajon. 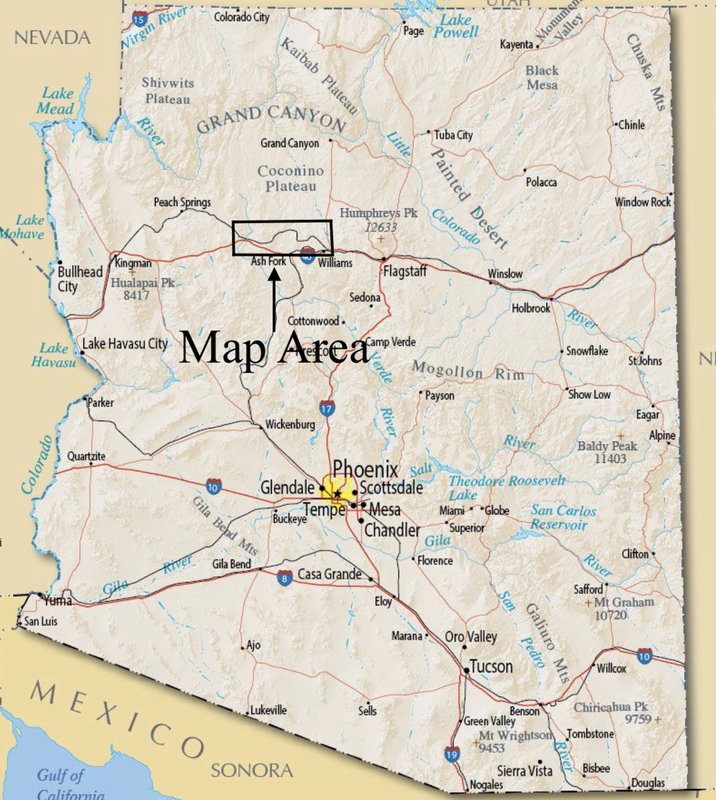 We are covering so much ground in this section because, to my mind at least, large stretches of the Transcon across far eastern Arizona are not that photogenic. I have reviewed my images from Lupton, Arizona, to the Petrified Forest National Park; only two of them pass muster. 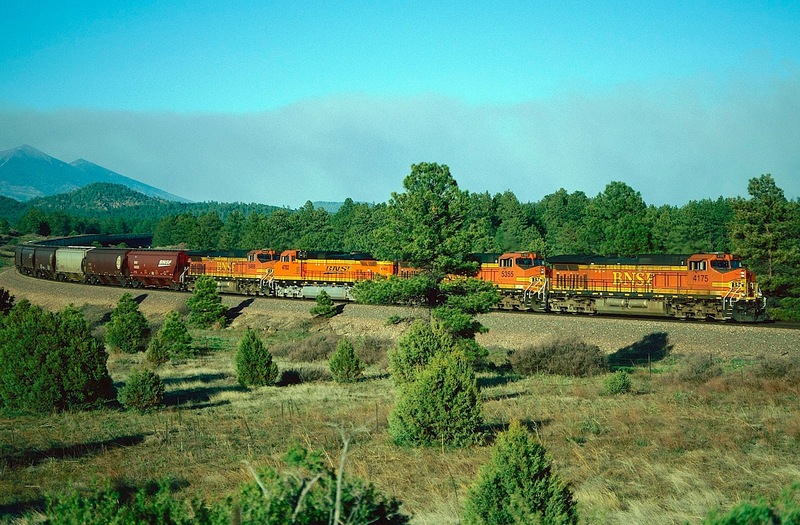 In that portion of far eastern Arizona, the Transcon spends most of its time in wash bottoms, surrounded by the few trees that grow in such harsh conditions. Others have taken wonderful shots there, but not me. Driving through this portion of the world, I feel like a tone-deaf man trying to enjoy a symphony. Instead we concentrate on the colors that a tone-deaf man can perceive -- the red cliffs of western New Mexico, the "Painted Cliffs" of light tan at the Arizona border, the yellows and oranges in the Petrified Forest in October, the burgundy sandstone on the uplift to the San Francisco Volcano Field -- still very active in the 21st century. These locations provided inspiration for the A.T.& S.F. travel posters of the first half of the 20th century, before passenger trains in the West were dealt a mortal blow by the interstate highway system. 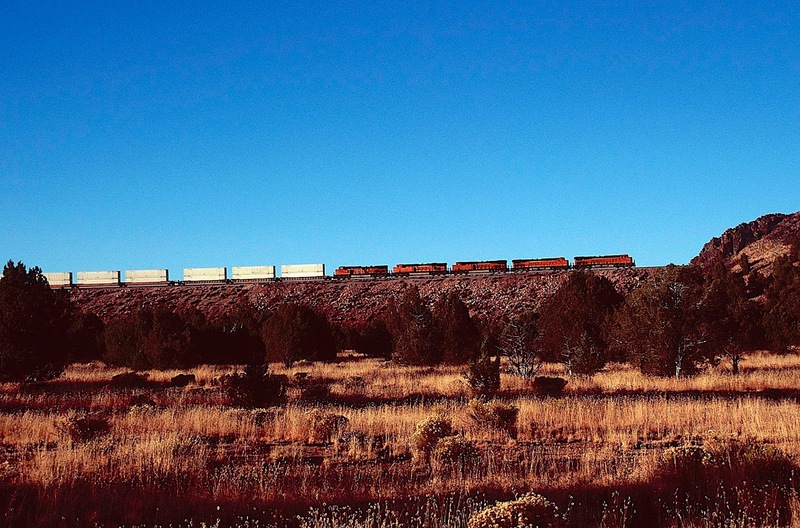 Photograph #19: Westbound stacks approach Grants, New Mexico, beneath a portion of the Mount Taylor lava flow. The town began in the late 19th century when three brothers named Grants won the contract to construct a portion of the Atlantic and Pacific Railroad. 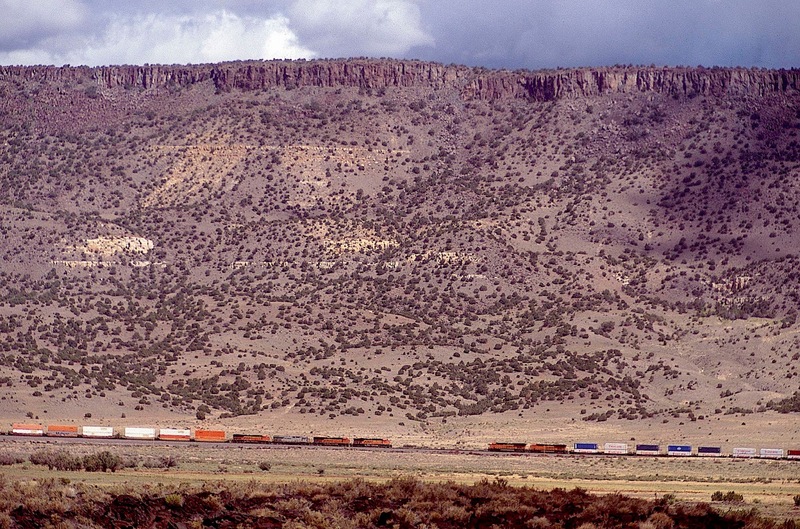 Photograph #20: Two BNSF intermodals meet below the Mount Taylor lava cap on the eastern outskirts of Grants, New Mexico. The lava cap forms the vertical cliffs at the top of the mesa and constitutes ground level when Mount Taylor first erupted. Over the eons, softer subsoils have eroded beneath the lava cap, forming the valley through which the Transcon runs today. Photograph #21: West of Grants, the Transcon turns north-northwest to avoid Mount Sedgwick, the tallest peak in the Zuni Mountains at almost ten thousand feet, a portion of the last remnants of the ancestral Rocky Mountains of the Pennsylvanian epoch. Here the Transcon follows a wide valley toward the Western Continental Divide. Note that the two tracks are divided here. Photograph #22: The tracks divide at Prewitt and turn to the west-northwest, eventually rejoining at Thoreau. 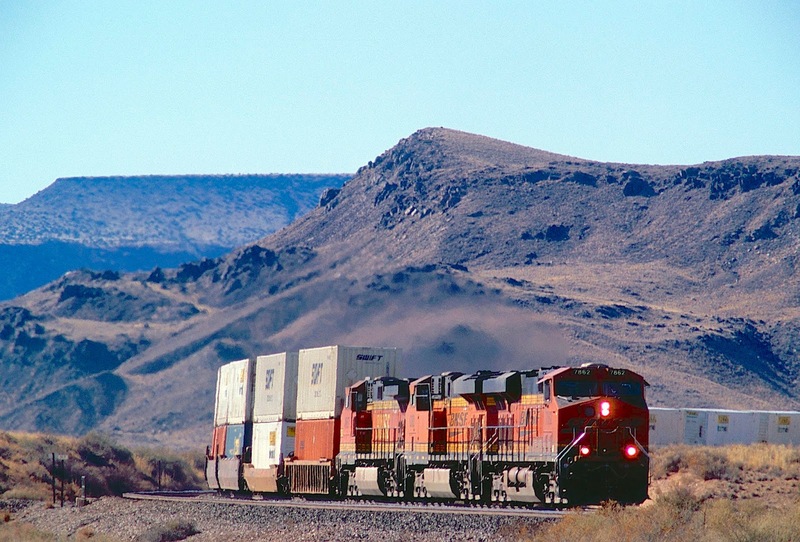 If you look closely in the background, you will see a railroad line (the BNSF Lee Ranch Subdivision) just above the double-stacks behind the motive power, branching from the mainline at Escalante Junction, heading north across the valley, ultimately climbing into the mesa to a Peabody Energy coal mine (the Lee Ranch Mine). 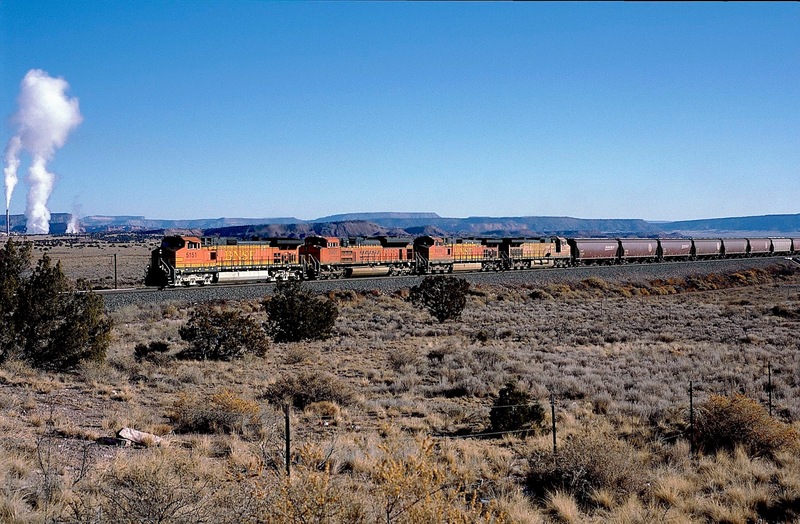 BNSF runs coal trains on this line, as does the Escalante Western, a railroad that carries coal from the mine to the Escalante Power Plant, which is reached from a spur about two and one-half miles north of Escalante Junction. 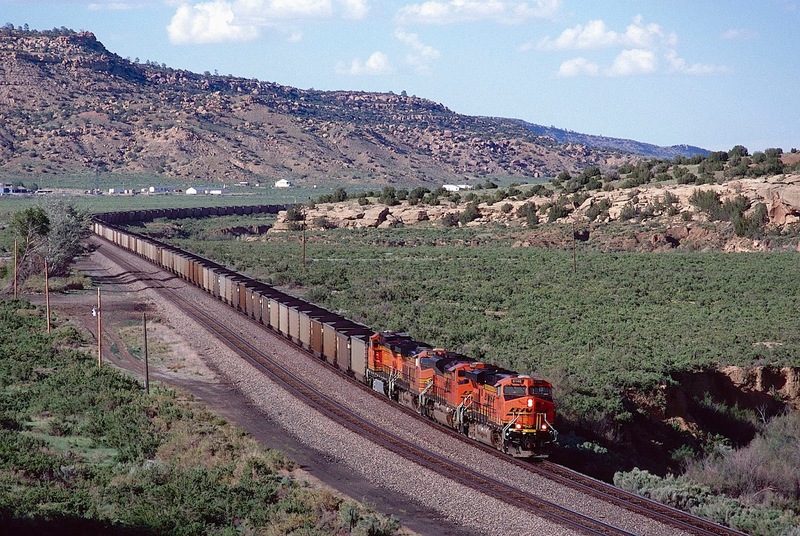 The last two and one-half miles of the Lee Ranch Subdivision are used exclusively by BNSF coal trains heading to the Transcon. Slightly west of Prewitt, branching off the northern track of the Transcon, is another spur track that runs to the other industries located near the power plant -- two paper mills. 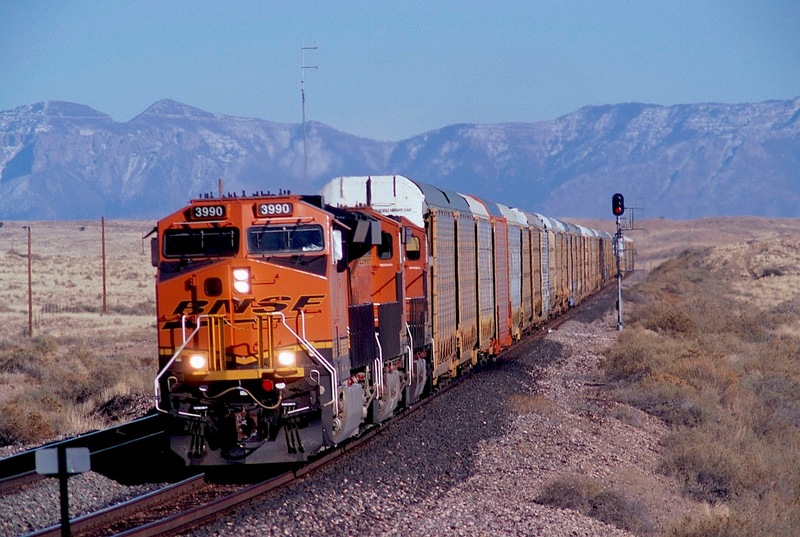 BNSF runs occasional local trains to pick-up products from the plants. 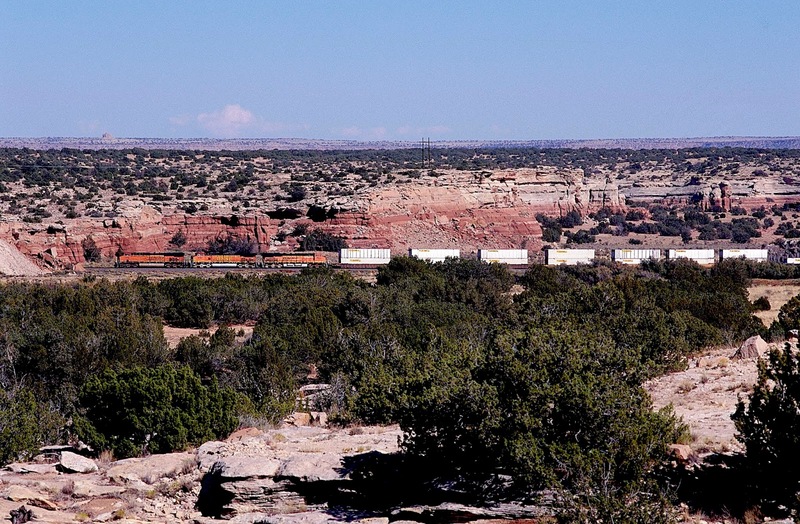 Photograph #23: A loaded BNSF coal train approaches the Transcon at Escalante Junction. 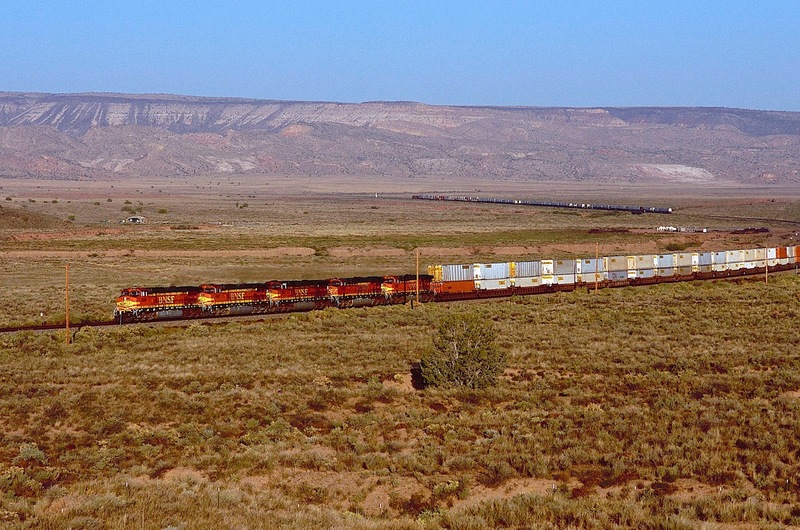 Photograph #24: Westbound grain rolls upgrade toward the Western Continental Divide, with the Escalante Power Plant in the background. Photograph #25: Pushers on eastbound stacks are rolling beneath several iterations of the Mount Taylor lava flows. Main One, primarily used for westbound traffic, is in the foreground. Photograph #26: Eastbound Amtrak No. 4 is cruising downgrade after having crossed the western Continental Divide (elevation 7263 feet) just west of Thoreau. 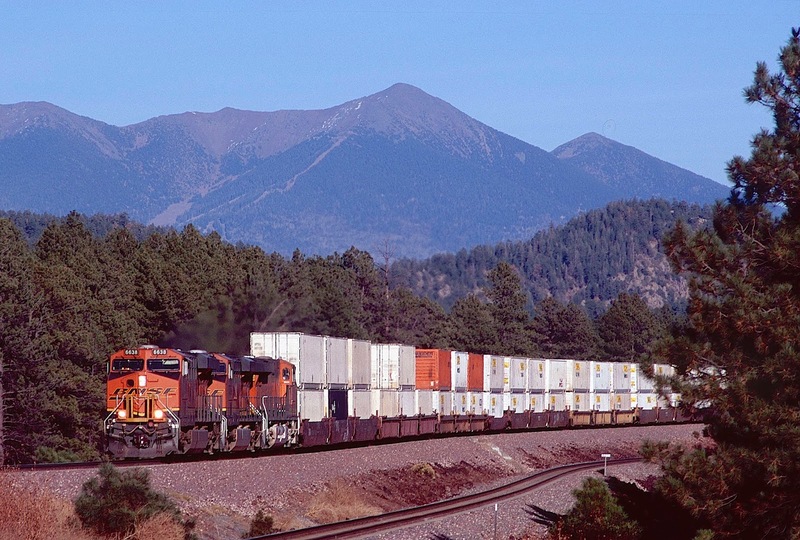 When you consider the BNSF's other crossing of the Continental Divide at Marias Pass and the Union Pacific's crossing in Colorado (Moffat Tunnel), the Transcon's crossing is almost mundane. There are no mountains here, just the remnants of the ancestral Rockies worn down to little more than hills. In fact, if you do not know you are crossing the divide, you will not even notice it. 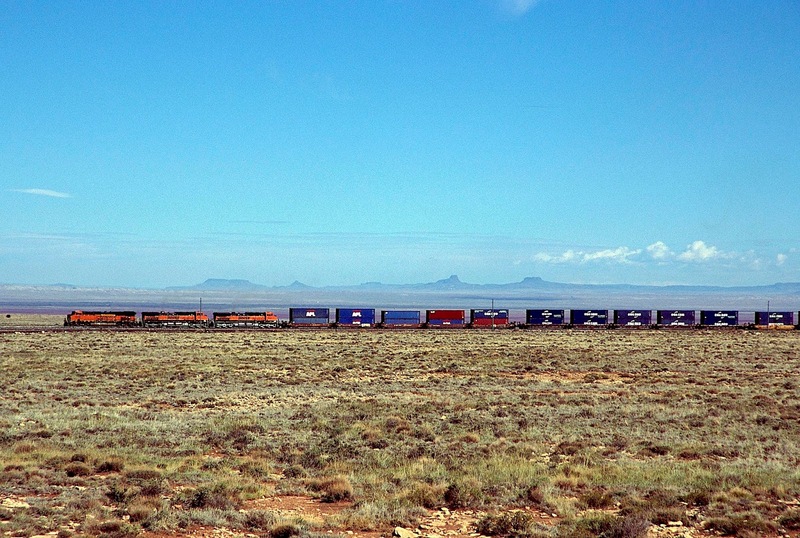 Photograph #27: Now we move about 100 miles west to Manuelito, New Mexico. In so doing, we skip Gallup, once a division point, now reduced to a small yard with little activity. The scenery around Gallup is nothing special, at least to my eyes. East of Gallup is Guam, where the Transcon splits again, the north track running very close to beautiful burgundy sandstone cliffs. However, the few roads into that area are all barricaded, and the land is closely watched by the local owners. I do not have a decent image of Guam. From Manuelito, one can look southwest along the tracks and see Arizona. 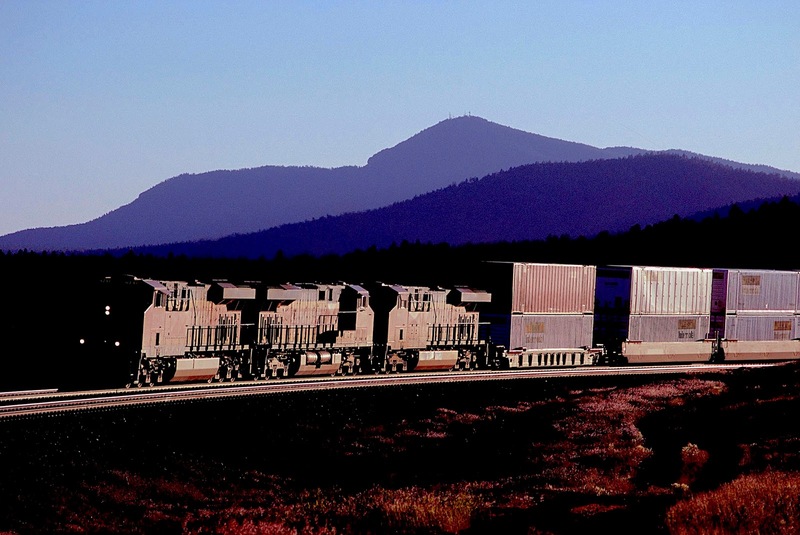 Photograph #28: These eastbound refrigerator cars are passing through Lupton, Arizona. The New Mexico border is about 500 yards ahead. 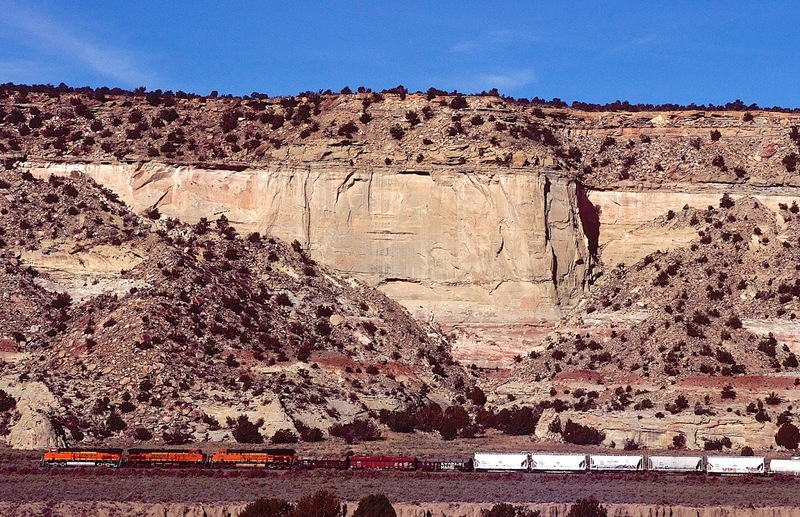 The Painted Cliffs, which tower over the tracks, Interstate 40 and old U.S. 66 (the roadway of which still exists at the state line) are made of sandstone, but a much lighter shade than found near the Western Continental Divide in New Mexico. Sandstone is a sedimentary rock composed mostly of quartz sand, though it also sometimes contains feldspar, silt and clay. Because these are generally light colored, sandstone is typically light tan, like the Painted Cliffs at Lupton. The sandstone near the divide in New Mexico contains iron oxide, which causes the dark red coloration. 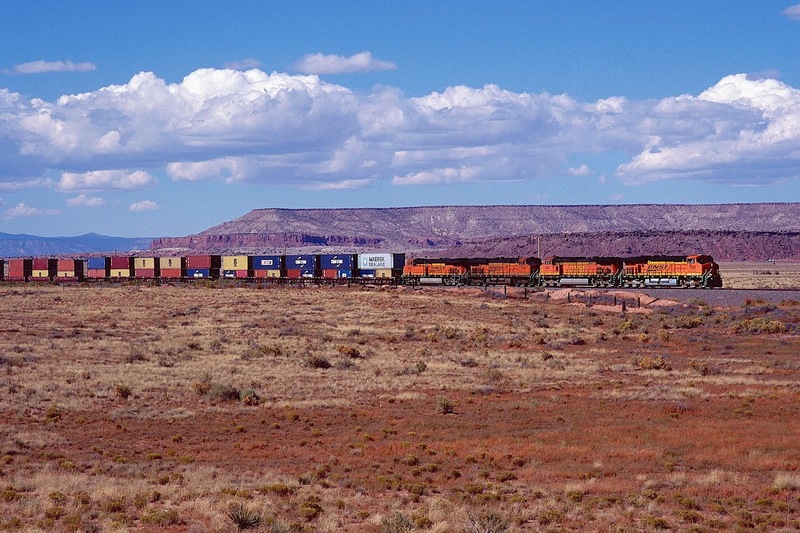 Photograph #29: A westbound merchandise freight at the Painted Cliffs. 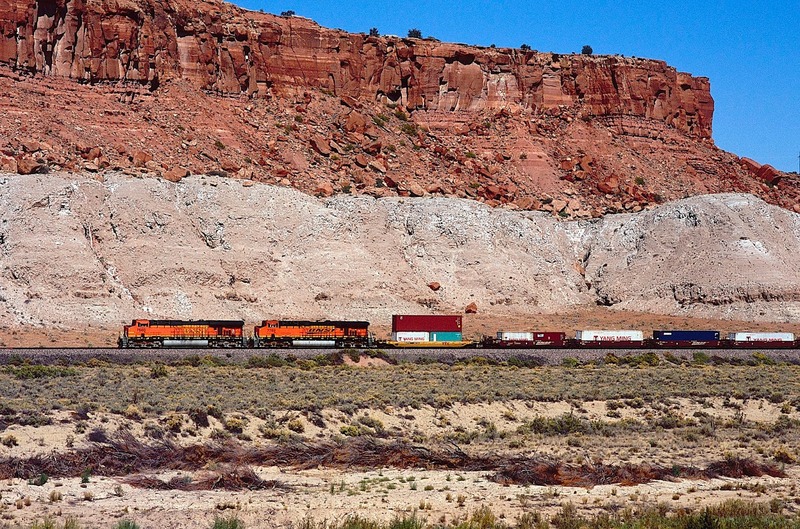 Photograph #30: With a hint of fall color showing, westbound stacks have left the Painted Cliffs and are headed to the high desert of eastern Arizona. Photograph #31: Across the far eastern Arizona high desert, the Transcon works it way from one wash to another before finally entering the valley of the Little Colorado River. Thus, the tracks are often hidden in the lowlands and obscured by foliage, even though rainfall here is usually measured in drops, not inches. 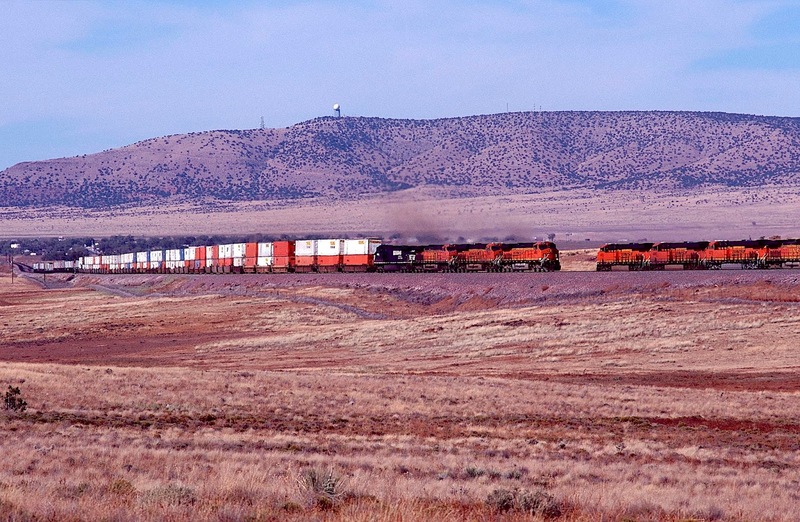 In this image, westbound stacks meet eastbound stacks at Nine Mile Wash in the Petrified Forest National Park. The old Adamana station lies about a half mile to the west, though no structures remain -- just a cross-over on the Transcon. Fall foliage is visible in the background in the wash bottom. 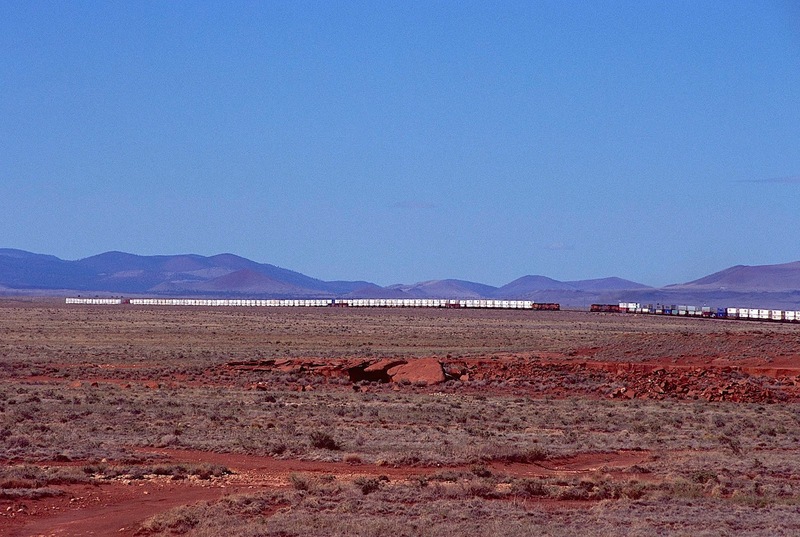 Photograph #32: Winslow, Arizona, is a division point on the Transcon and home to a busy yard. Action is always fierce; rainfall rare. 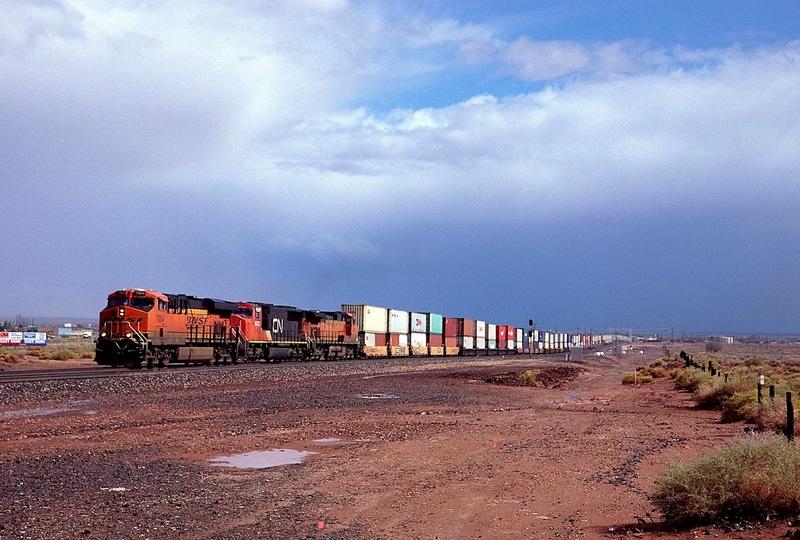 I include this image of a westbound intermodal leaving Winslow to prove that it sometimes does rain in the desert. 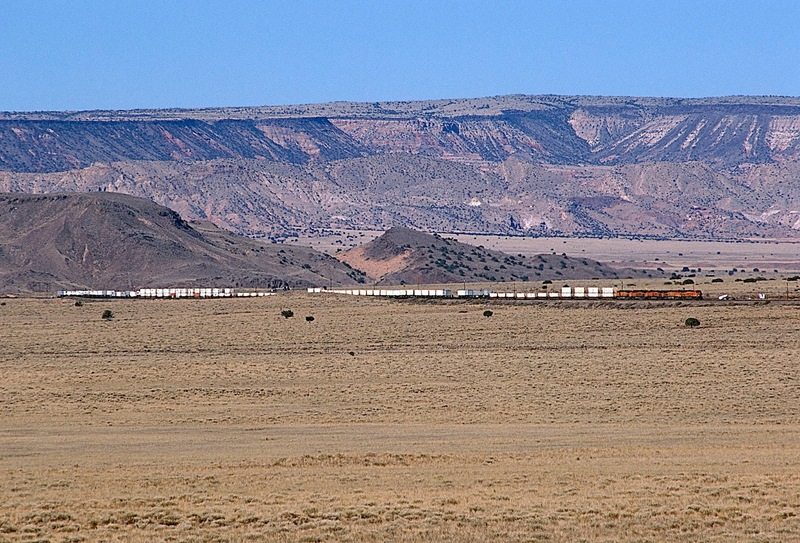 Photograph #33: West of Winslow, the Transcon leaves the valley of the Little Colorado River and heads out across the open desert toward the San Francisco Volcano Field. If you take exit 233 off Interstate 40 and head south, you will find Meteor Crater. If you head north, you will drive across some remarkably rugged and rocky roads to the Transcon, where this image and several following were taken. I recommend four-wheel drive and high ground clearance. Also, be careful after rainfall. You may be stuck for a long time. 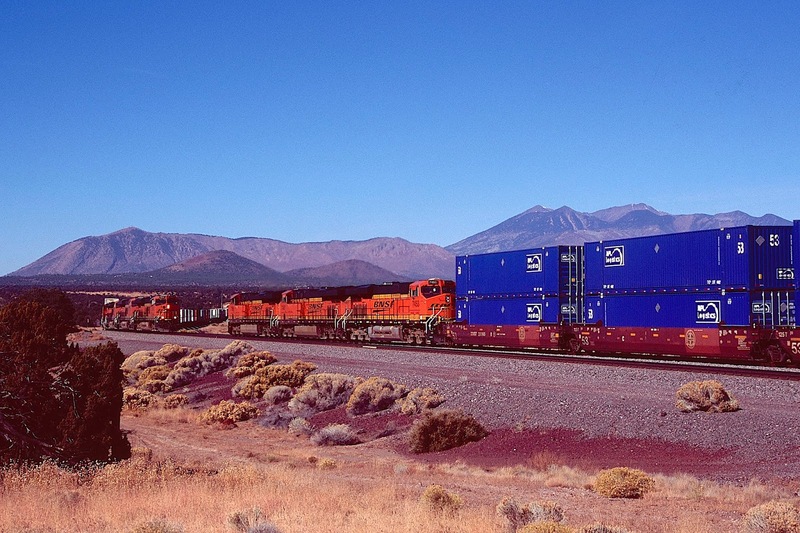 Photograph #34: Westbound stacks speeding across the desert. 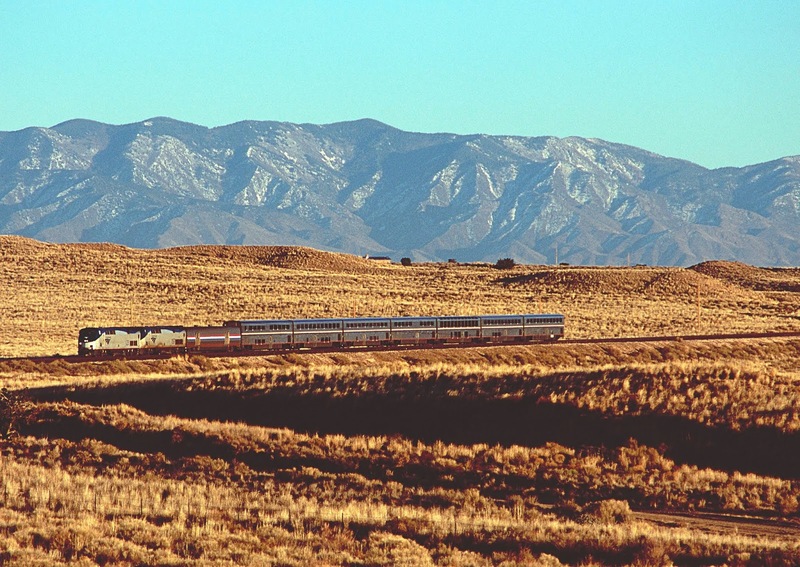 Photograph #35: An eastbound across the high desert, with the San Francisco Volcano Field in the background. Photograph #36: Eastbound and westbound stacks meet beneath the San Francisco Volcano Field, an area of young volcanoes along the southern boundary of the Colorado Plateau. The field is still active; its most recent eruption occurred about 1060. During its six million year history, this field had produced more than 600 volcanoes! 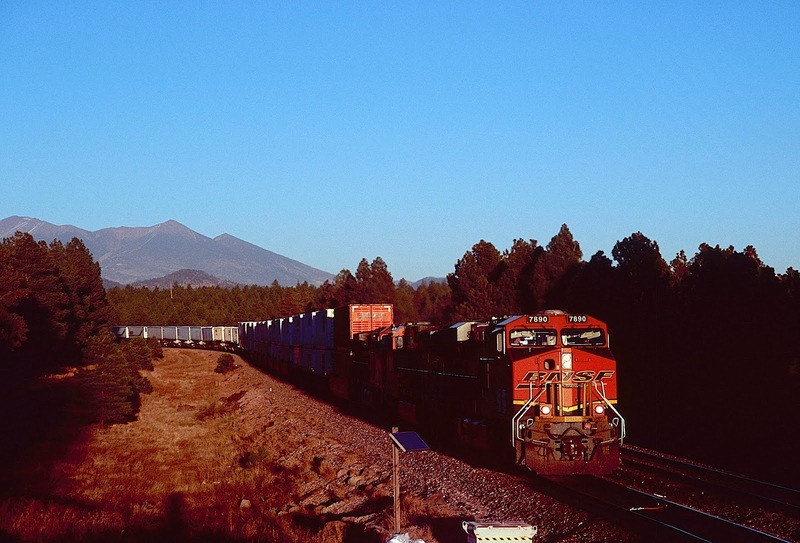 Photograph #37: More eastbound stacks, with Humphrey's Peak rising in the left background -- an eroded stratovolcano rising 12,633 feet, the highest point in Arizona. Try to image the size of the eruption that created this monster. This portion of Arizona illustrates nicely how mountains (or in this case, volcanoes) create their own rainfall. As the tracks increase in elevation, average annual rainfall also increases. 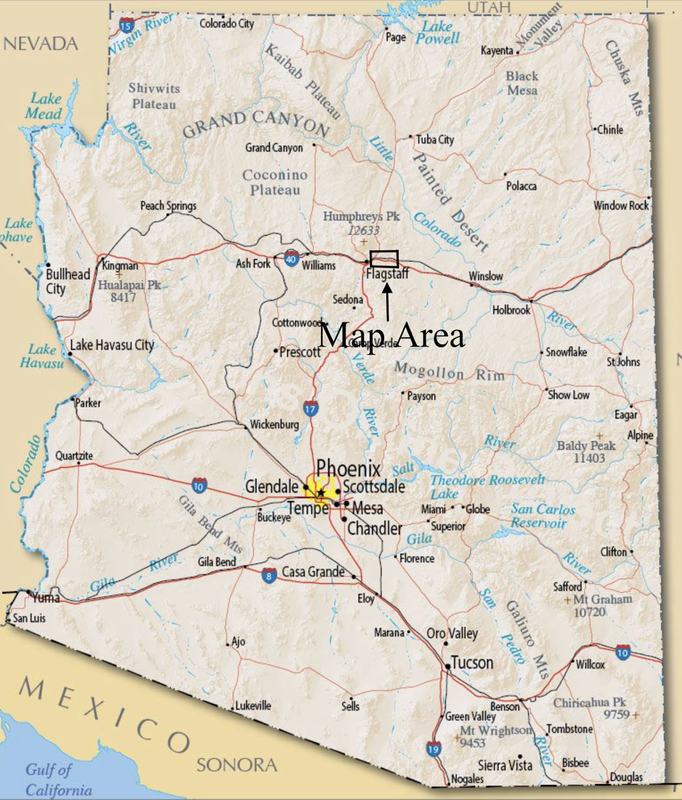 For example, Winslow, Arizona (elevation about 4,800 feet), in the heart of the desert, receives about seven inches of rain per year and 8 inches of snow. Flagstaff (elevation about 6,900 feet), at the base of Humphrey's Peak, receives about 24 inches of rain per year and about 77 inches of snow. The distance between the two is about 55 miles. Rainfall here is caused when warm moist air off the Pacific from the southwest is pushed upwards as it hits the volcano peaks. As the air rises, it cools. Because cool air holds less moisture than warm air, some of the water vapor condenses and forms rain. This process generally occurs on the windward side of mountains. On the back side is the so-called "rain shadow" where little if any moisture falls. 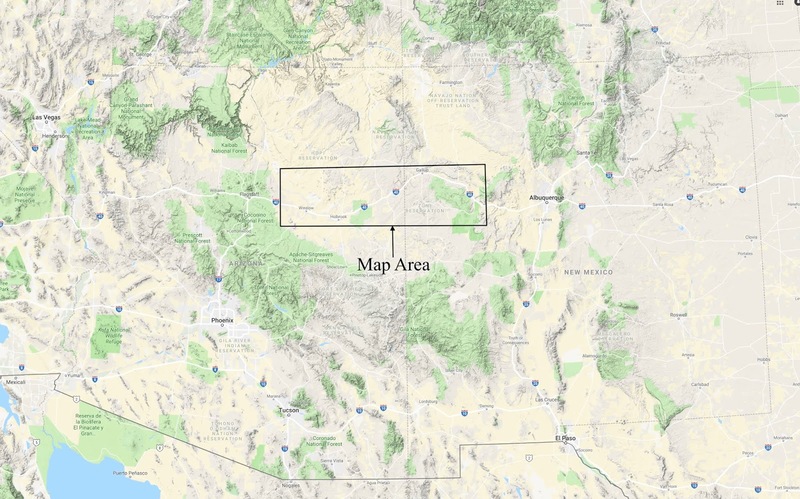 In the case of large mountain ranges, such as the Sierra Nevada, the rain shadow creates a desert -- the Sierras create the Mojave Desert, Death Valley and Nevada. 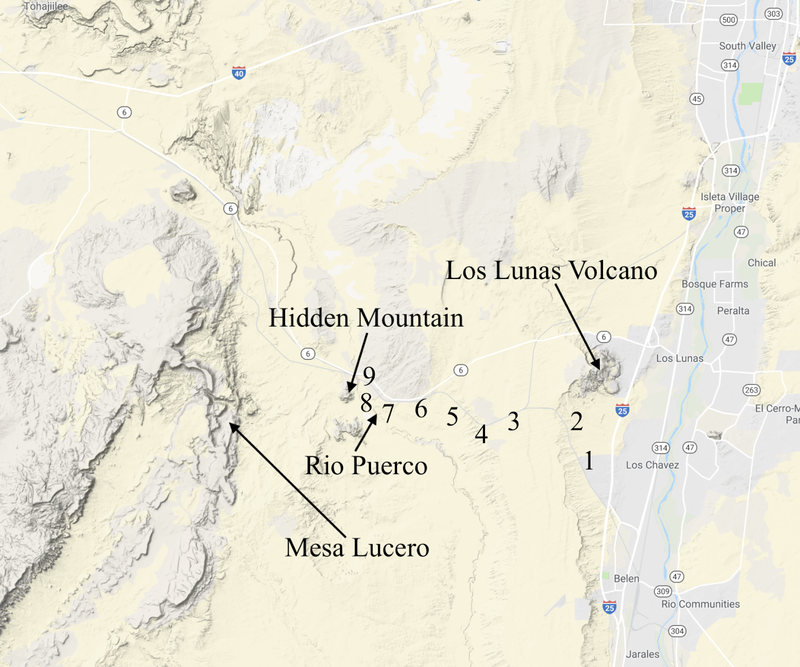 Here in central Arizona, the San Francisco Volcano Field already sits in a desert, and so the lack of rain behind the highlands has little additional effect. As the Transcon climbs higher, the vegetation transforms from scrub grass to piñon-juniper to ponderosa pine, all in about 20 miles. I am unaware of any other location in North America where the plant life changes so rapidly. 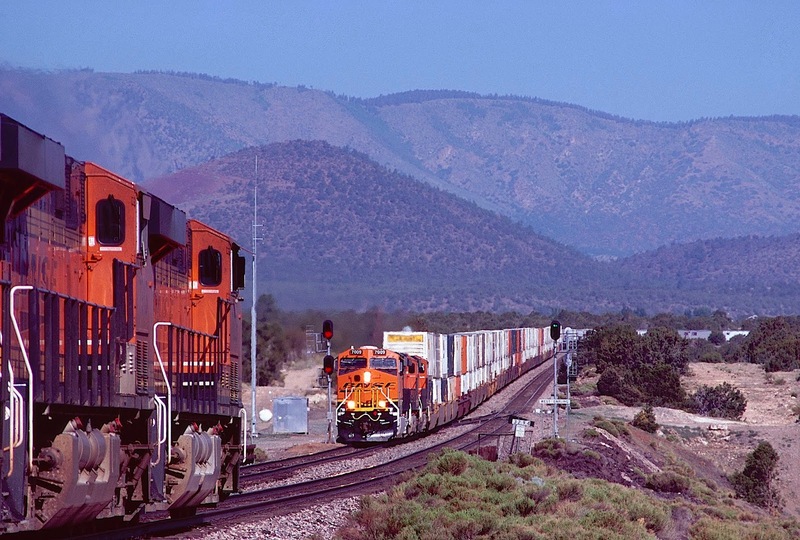 Photograph #38: Two intermodal trains meet in the bowl at Darling (called Winona on highway maps, as immortalized in Bobby Troup's famous song "Route 66" -- "Don't forget Winona"). Trains in both directions roll downgrade to the West Darling switch. The eastbound train in the background is just starting to climb. Vegetation here is mostly piñon-juniper. Photograph #39: Another meet at Darling. The curve here was once much tighter but was straightened in 1985 after the overpass over the tracks was rebuilt. The tallest peaks in the San Francisco Volcano Field are visible in the background. 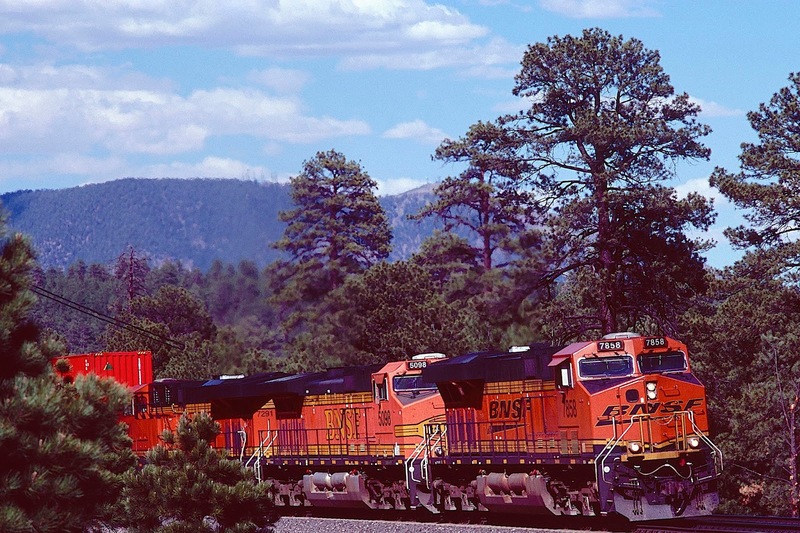 Photograph #40: BNSF 7277 East is climbing upgrade from the West Darling switch. Photograph #41: Past Darling, the tracks head northwest about a mile, before making a 90 degrees curve to the southwest. 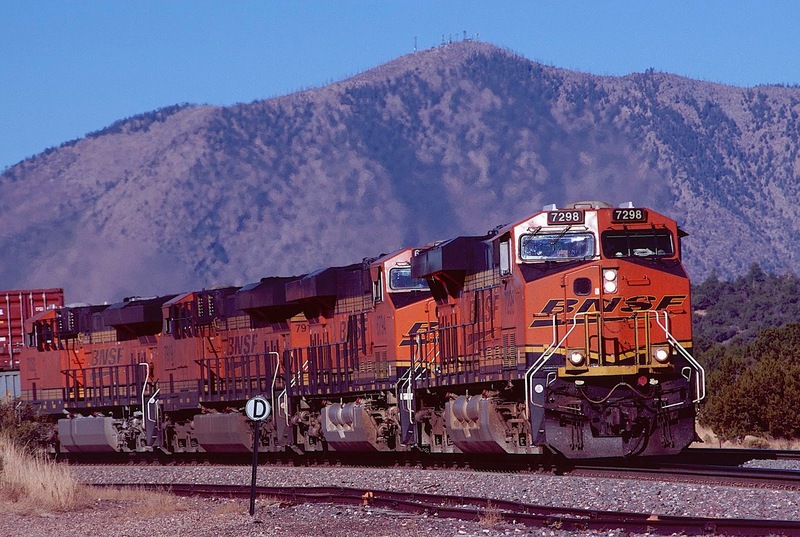 Here a pristine BNSF Warbonnet leads eastbound stacks around those 90 degrees. Photograph #42: Eastbound stacks are crossing Cosnino Road -- MP 333.1 -- easily accessible off of Interstate 40. Photograph #43: Another eastbound at Cosnino Road. 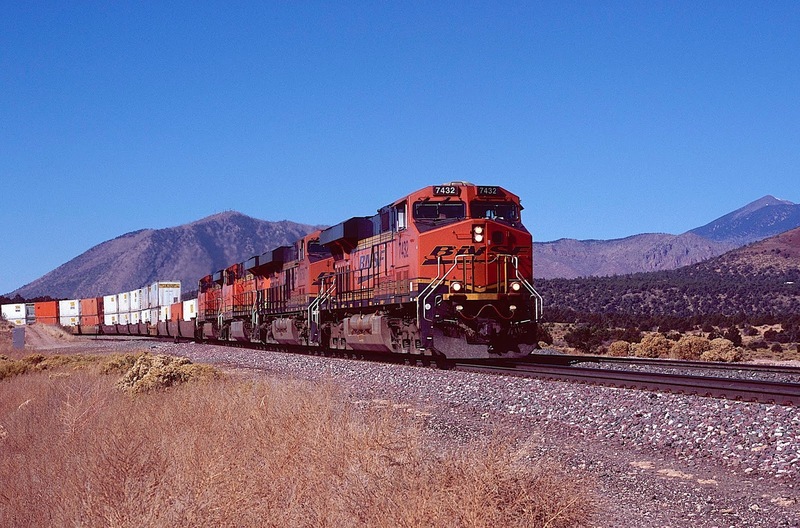 Photograph #44: Two trains are meeting on the second curve past Cosnino Road. This location is accessible from the Arizona National Scenic Trail, which runs approximately 800 miles from Mexico to Utah. The trail crosses the tracks about a half-mile west of Cosnino Road, then follows the Transcon (sometimes close, sometimes through the trees) until old Route 66 crosses the tracks again. At this location, a few Ponderosa Pines are growing, indicating the increase in altitude and rainfall. Photograph 45: Here is the historic Route 66 overpass across the Transcon -- a favorite location of photographers for generations. 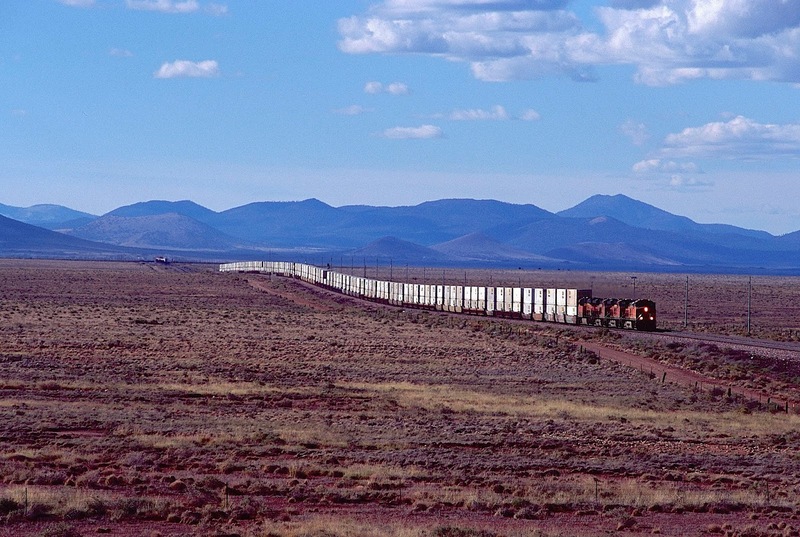 The train is on the eastern edge of Flagstaff, headed east. 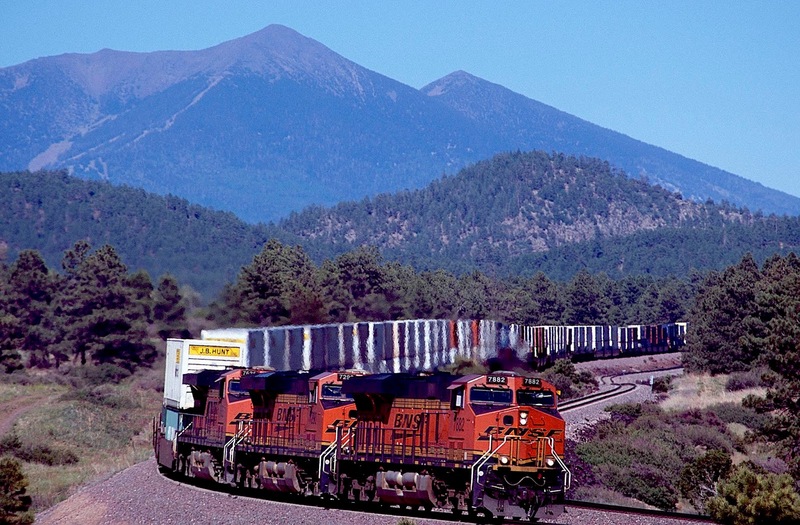 In this section, we follow the Transcon from the Arizona Divide, the railroad's summit across the San Francisco Volcano Field, to MP 369.5, a long-time favorite location of rail photographers and part of the largest Ponderosa Pine forest in North America, again a testament to the rain generated by the huge stratovolcanoes. Despite the additional moisture, however, Flagstaff and environs can grow extremely dry in the fall and become a perfect tinderbox for wildfires. Seeing smoke on the horizon in this country is like spotting a purple funnel in my home state of Oklahoma -- time to evacuate. 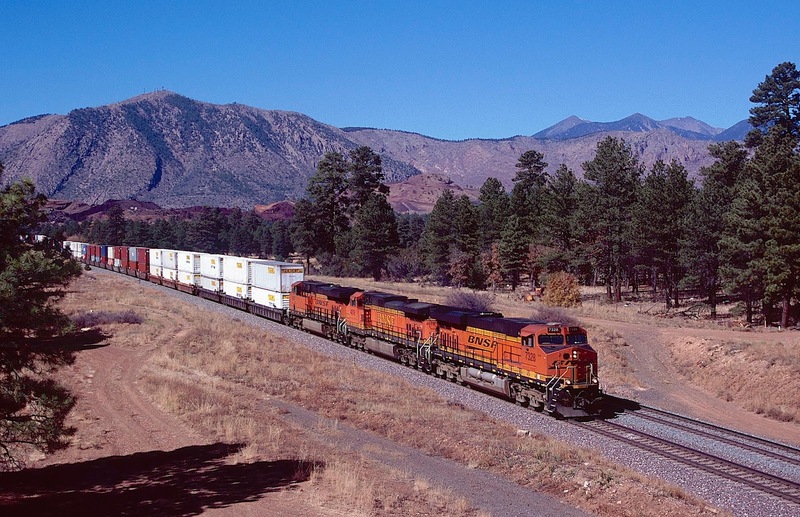 This section of the Transcon is not easily accessible from Interstate 40, but the line runs through the Coconino National Forest, and the tracks can be reached on a variety of Forest Service roads, some in decent condition, others not so much. If you are in a vehicle with low ground clearance, watch out for rocks, or you may end up riding back to town in a wrecker. 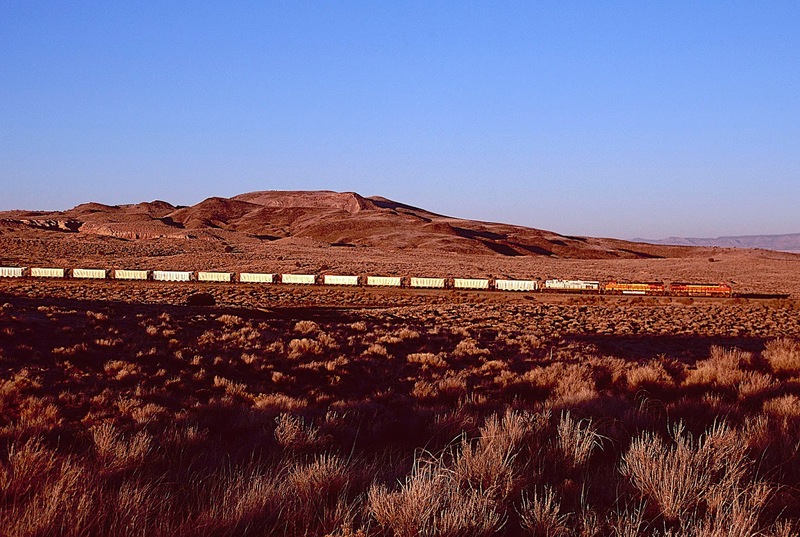 From Winslow, the line climbs about 3000 feet to reach the top of the grade at Riordan, then heads downgrade to Williams, the beginning of the Crookton Cut-off and some of the most isolated territory in North America. The forest is thick but not impassible; undergrowth is negligible, as though a team of gnomes walks through the trees each night and chops away everything at ground level. Summers are rarely hot; winters are always cold. Some of the most spectacular scenery in North America is found in the San Francisco Volcano Field, and I hope that the images in this post convey that beauty. 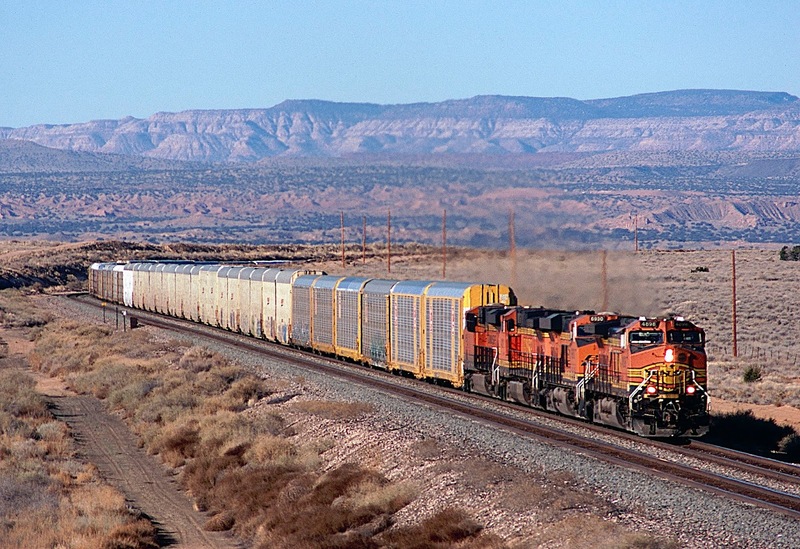 Photograph #46: BNSF 7858 West is approaching the Arizona Divide at Riordan. This location requires a short hike off West Naval Observatory Road. Photograph #47: Pushers on an eastbound stack train at Maine (MP 362.5), named for the USS Maine which exploded and sank in Havana Harbor in 1898, a big deal at the time but mostly forgotten today. Photograph #48: A westbound grain train is rolling downgrade beneath the first plumes of smoke from a wildfire. This location is accessed from Spritz Spring Road, and when the image was taken, smoke had just appeared on the horizon. Within a few minutes, local firefighters were on the scene, and the blaze was quickly extinguished, turning what could have been a major disaster into just "another day at the office." Photograph #49: Same location on a day without smoke. Photograph #50: Same location in fall, when sun is on the other side of the tracks. Photograph #51: From the same location but looking west, with Bill Williams Mountain in the background -- another stratovolcano. 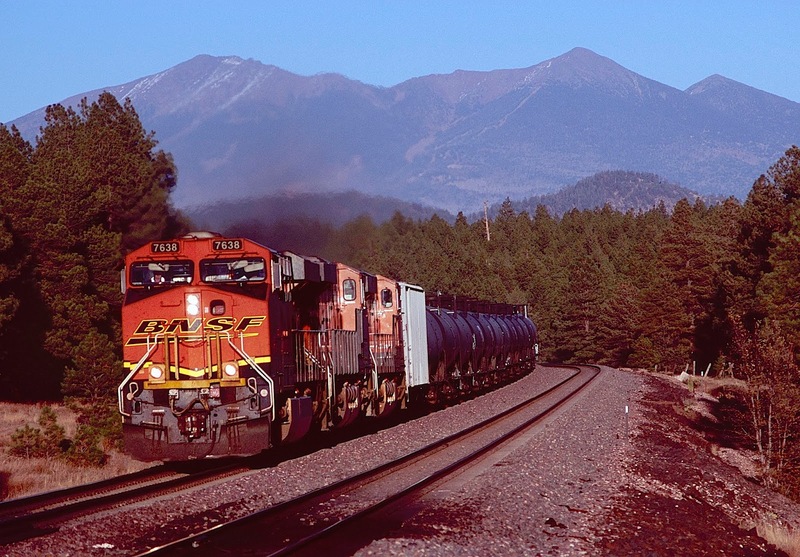 Photograph #52: One of the best locations for photography on the west side of Flagstaff is MP 367, where this image of a westbound crude oil train was taken. When this was Santa Fe trackage, a signal bridge guarded the mains, but that was torn down years ago. This location can be reached by about a two mile hike or else a drive down a primitive Forest Service road. It is well worth the effort. Photograph #53: The same location at sunset. BNSF 7890 West is passing the location of the old signal bridge. Photograph #54: This location is MP 369.5, another photographer favorite. It took some considerable effort to find this spot, including slogging my jeep through several deep mud holes, but eventually I made it. As you will note, the pines have grown so tall that only the tops of the peaks are visible. Thirty years ago, the trees were about 20 feet shorter. Oh, well, at least I got there before the volcanoes disappeared. We now approach some of the most isolated country in North America, so isolated that if your vehicle breaks down, you will spend a long time walking back to civilization -- and walking will be your only salvation, because no one will come along to render assistance. Along the Crookton Cut-off, I feel as though everyone in the world, except me, has been killed in an atomic holocaust. Why I remain is unknown. But the solitude does not last. 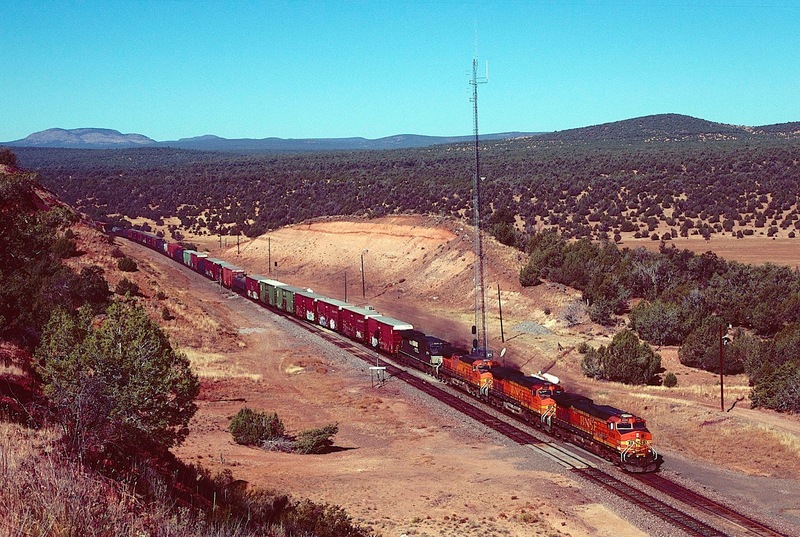 Every 15 minutes or so, the rasp of steel wheels on steel rails sounds in the distance, growing steadily louder across the piñon forest, and then a headlight appears, and I remember that I am living in the 21st century, a century in which railroads alone have pierced this solitary world. It was not always so. 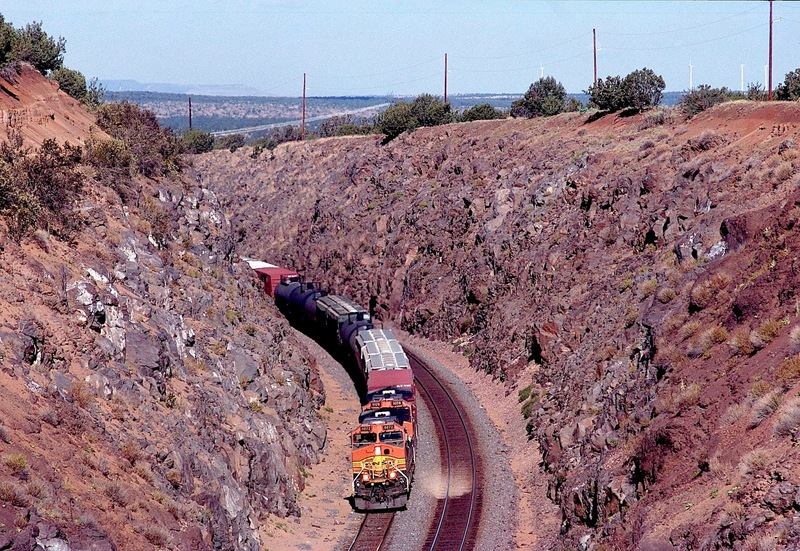 Until the final days of 1960, the Atchison, Topeka and Santa Fe Railroad headed west out of Williams, Arizona, down the face of a fierce escarpment created by the hundreds of surrounding volcanoes. The original, single-track line curved through Johnson Canyon Tunnel on a grade that challenged trains in both directions. Eastbounds were likely to stall on the grade, while westbounds were likely to run away down the hill. So the second track constructed years later by Santa Fe followed a more circuitous route involving multiple horseshoe curves, winding far to the north, then turning due south to avoid Johnson Canyon. The new route, however, was almost as torturous as the original; both were huge operational headaches. Another headache was Ashfork, where trains in both directions struggled against significant grades, with a narrow horseshoe at Gleed Station in a canyon so tight that you could stand on one track and throw a rock across to the other. Today the old roadbed still exists and can be driven in a high clearance, four-wheel-drive vehicle, but I would not advise the trip. It is every bit as difficult in a Jeep as it was for the Santa Fe. 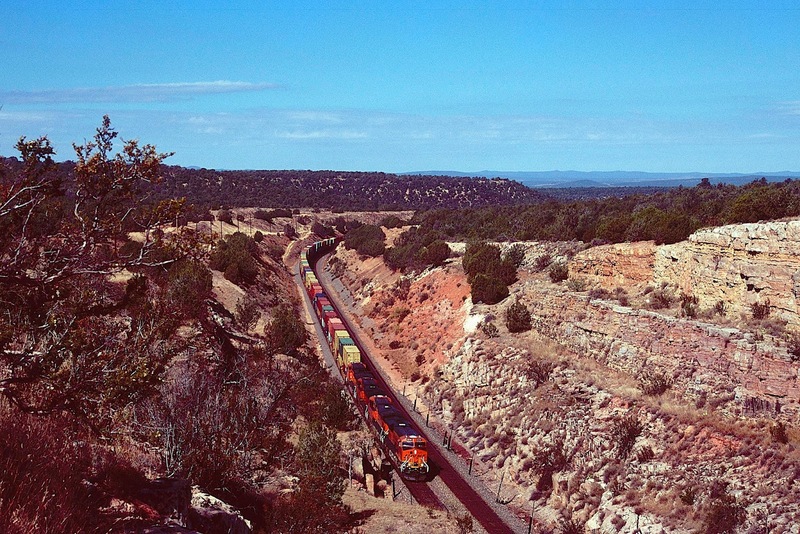 Thus, on December 19, 1960, the Santa Fe opened the Crookton Cut-off, a new route from Williams to Crookton that entirely bypassed the escarpment and canyons that had caused the railroad so much grief. The original line through Johnson Canyon was abandoned, while the second line with the multiple horseshoe curves was retained for traffic to Phoenix. West of Ashfork, the double-track mainline was completely abandoned, though the old roadbed is plainly visible to this day. The new double-track Transcon headed northwest out of Williams, blasting through layer upon layer of lava deposited over eons by the many volcanoes. Construction methods were comparable to those used for the interstate highways, and the new line looked very much like an interstate, with huge cuts and fills, sweeping curves and long straight-aways. If you have ever wondered what railroads would look like had they been constructed after the Second World War, take a trip to the Crookton Cut-off. Photograph #55: BNSF 4872 East navigates through the big cut at Perrin, the first cross-over west of Williams. Almost the entire cut breaches lava laid down over millions of year. Sandstone is just barely visible in the top left of the image, a thin veneer over a cataclysmic history. Photograph #56: Eastbound stacks are roaring through the next cross-over west, the big cut at Doublea, which stretches a mile and is 115 feet deep in the middle, with terraced sides to minimize rock slides. The name comes from the nearby Double A Ranch. This is the one small section of the Crookton Cut-off that does not cross the volcano field; the rock here is limestone and sandstone, and several quarries in the area provide decorative specimens to landscapers. Photograph #57: A meet in the big cut at Doublea. 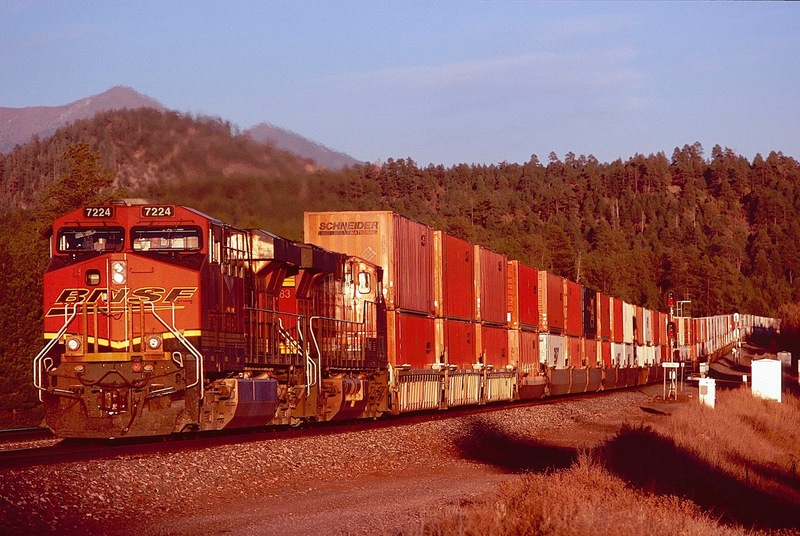 Photograph #58: Westbound stacks are exiting Doublea at MP 396. Bill Williams Mountains watches in the background. Photograph #59: Eastbound stacks approaching the west end of Doublea. Photograph #60: The next cross-over after Doublea is Eagle Nest, named for Eagle Nest Mountain in the Kaibab National Forest. The tracks have returned to the volcano field, covered here with a piñon-juniper forest. 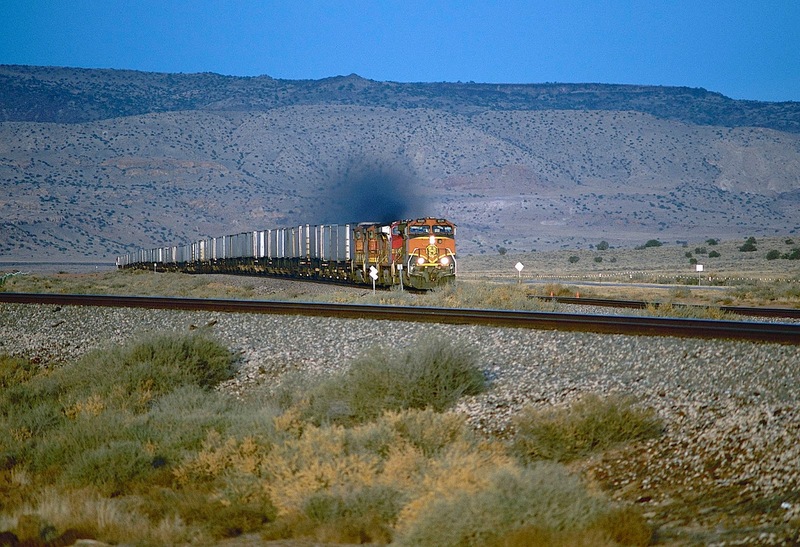 A westbounder approaches the signals, while in the background, eastbound trailers are speeding down the tangent toward Doublea. This is a good example of how the Crookton Cut-off looks like an interstate highway. Photograph #61: Westbound stacks at Eagle Nest. Photograph #62: An eastbound manifest is crossing mains at Eagle Nest. Notice the shield volcano in the upper left, caused by viscous lava flowing slowly from an eruption and piling upon itself, like maple syrup, rather than flying into the air and falling to earth to form a cinder cone. Photograph #63: The big fill at Eagle Nest. One more example of how the Crookton Cut-off was constructed like an interstate highway. Photograph #64: Eastbound stacks at Crookton, where the Cut-off ties back into the original mainline. The shield volcano in the background is the same as shown in Photograph #62. Photograph #65: A meet at Crookton. The dirt road in the foreground is the route of the original mainline. Photograph #66: A meet on the eastbound slope of Seligman (emphasis on second syllable), with the Aubrey Cliffs in the background. Sitting in a bowl such that both eastbound and westbound trains must travel upgrade, Seligman was named for Jesse Seligman of J.W. Seligman & Co., a financier of the original Atlantic and Pacific Railroad. Once the site of a Harvey House, which closed in 1948, Seligman was a division point until 1985. Today, it is mostly a traveler's curiosity (filled with tourist courts and drive-ins from the 1940's and 50's) on old U.S. Highway 66, which is still maintained through this part of Arizona. 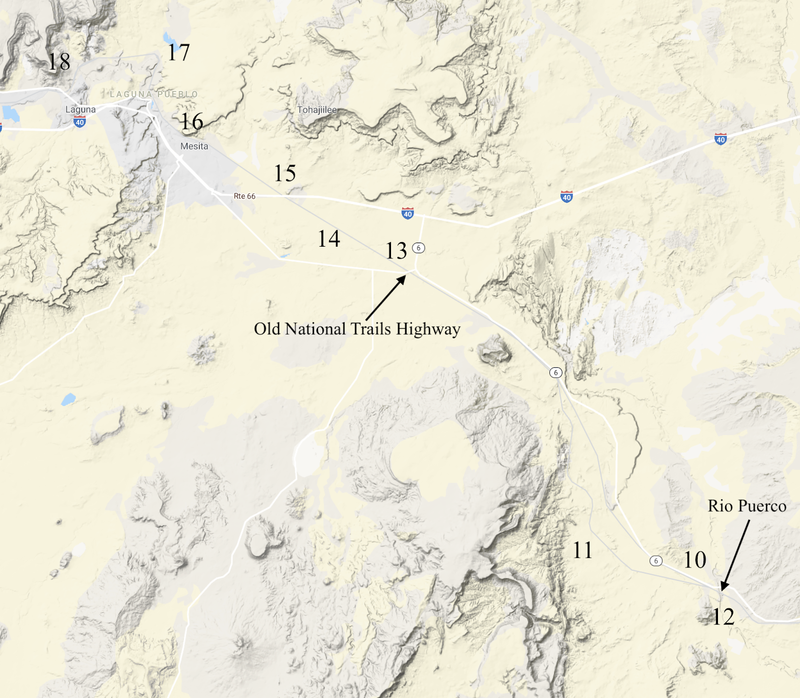 There are also two Seligman Exits (121 and 123) on Interstate 40, which heads southwest across mountains to Kingman, while the Transcon runs northeast across the Aubrey Valley for a much milder summit at Yampai. 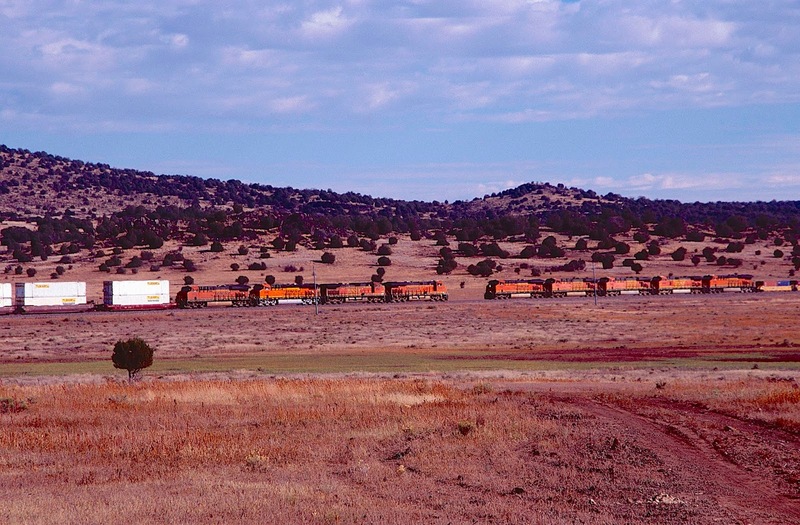 Photograph 67: Two BNSF intermodal trains meet in the Aubrey Valley on the western edge of Seligman. The Aubrey Cliffs are in the background. Thus ends Part Three of the Transcon survey. 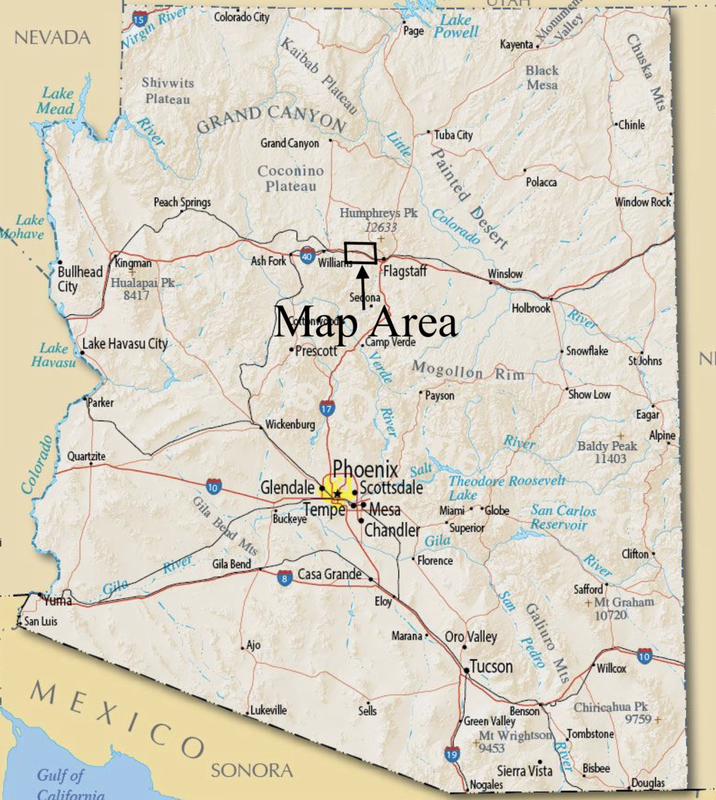 Part Four begins at Crozier Canyon in Arizona and extends to the mouth of Cajon Canyon in California. 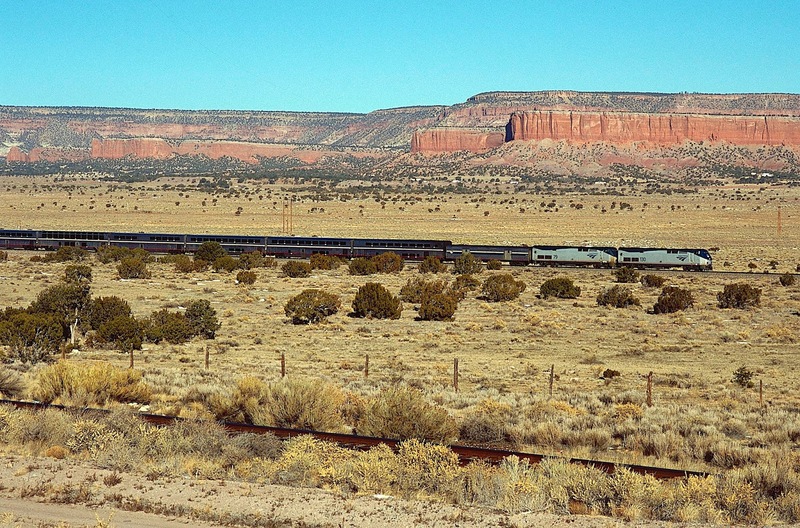 In this approximately 1000 miles, we will find some of the most spectacular railroad scenery in North America.